© 2012 Bergeson & Campbell, P.C., All Rights Reserved * Presented by: 1 H OUSTON C HEM S AFE I NC. A WDBE ▪ S INCE 1992 H OUSTON C HEM S AFE. COM 11430. 1 © 2012 Bergeson & Campbell, P.C., All Rights Reserved * Presented by: 1 H OUSTON C HEM S AFE I NC. A WDBE ▪ S INCE 1992 H OUSTON C HEM S AFE. COM 11430 S LASH P INE P LACE T HE W OODLANDS TX 77380 M ARY S CAGGS P RESIDENT M ARY @H OUSTON C HEM S AFE. 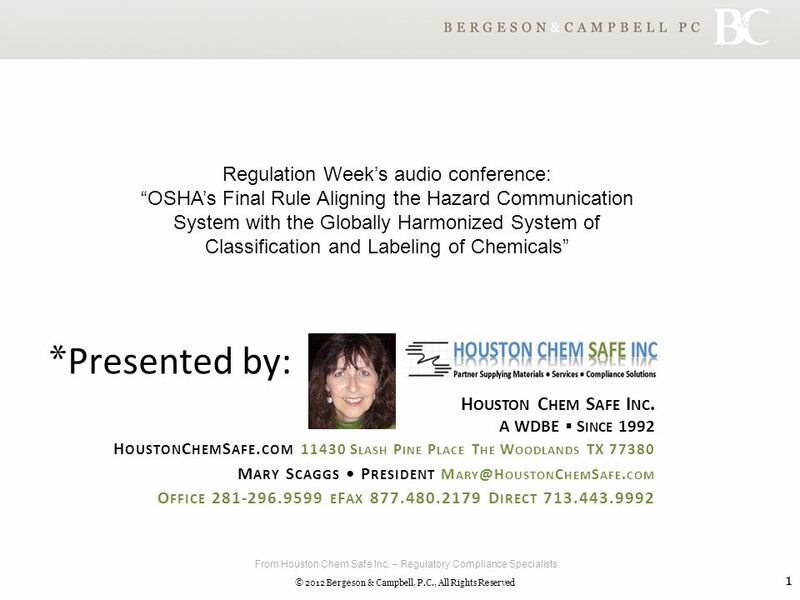 COM O FFICE 281-296.9599 E F AX 877.480.2179 D IRECT 713.443.9992  OSHA’s Final Rule Aligning the Hazard Communication System with the Globally Harmonized System of Classification and Labeling of Chemicals Regulation Week’s audio conference: “OSHA’s Final Rule Aligning the Hazard Communication System with the Globally Harmonized System of Classification and Labeling of Chemicals” From Houston Chem Safe Inc. – Regulatory Compliance Specialists. 2 © 2012 Bergeson & Campbell, P.C., All Rights Reserved * Presented by: 2 H OUSTON C HEM S AFE I NC. A WDBE ▪ S INCE 1992 H OUSTON C HEM S AFE. COM 11430 S LASH P INE P LACE T HE W OODLANDS TX 77380 M ARY S CAGGS P RESIDENT M ARY @H OUSTON C HEM S AFE. COM O FFICE 281-296.9599 E F AX 877.480.2179 D IRECT 713.443.9992  Following material obtained after attending an audio conference sponsored by Regulation Week.  *Permission to share this info obtained from Christopher Bryant of Bergeson & Campbell, P.C. From Houston Chem Safe Inc. – Regulatory Compliance Specialists. 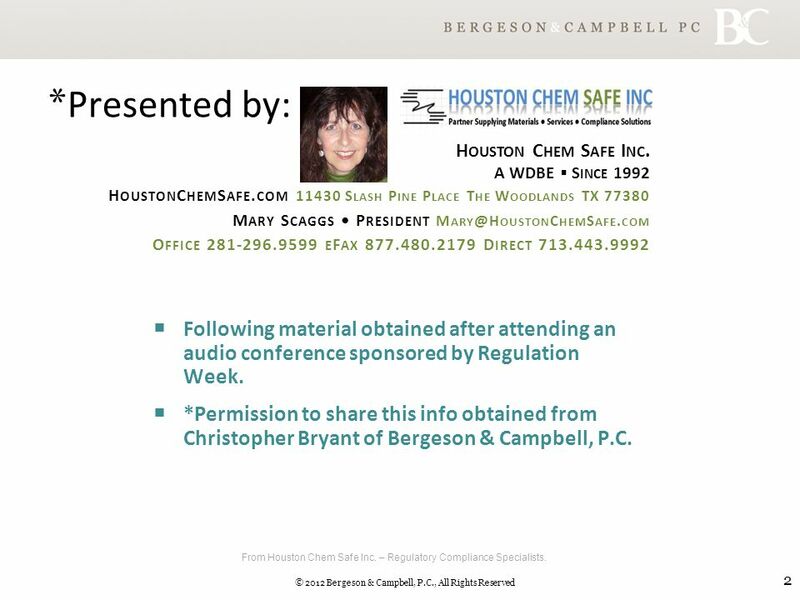 3 © 2012 Bergeson & Campbell, P.C., All Rights Reserved * Presented by: 3 H OUSTON C HEM S AFE I NC. A WDBE ▪ S INCE 1992 H OUSTON C HEM S AFE. COM 11430 S LASH P INE P LACE T HE W OODLANDS TX 77380 M ARY S CAGGS P RESIDENT M ARY @H OUSTON C HEM S AFE. COM O FFICE 281-296.9599 E F AX 877.480.2179 D IRECT 713.443.9992  Following material obtained after attending a webinar sponsored by REGWEEK.  *Permission to share this info obtained from Christopher Bryant of Bergeson & Campbell, P.C.  Are you ready for OSHA HazCom 2012 & GHS? Houston Chem Safe Inc can help.  Our regulatory compliance partners include chemical management software providers, SDS Sheets authoring & management.  Free demos & transition plan analysis services. From Houston Chem Safe Inc. – Regulatory Compliance Specialists. 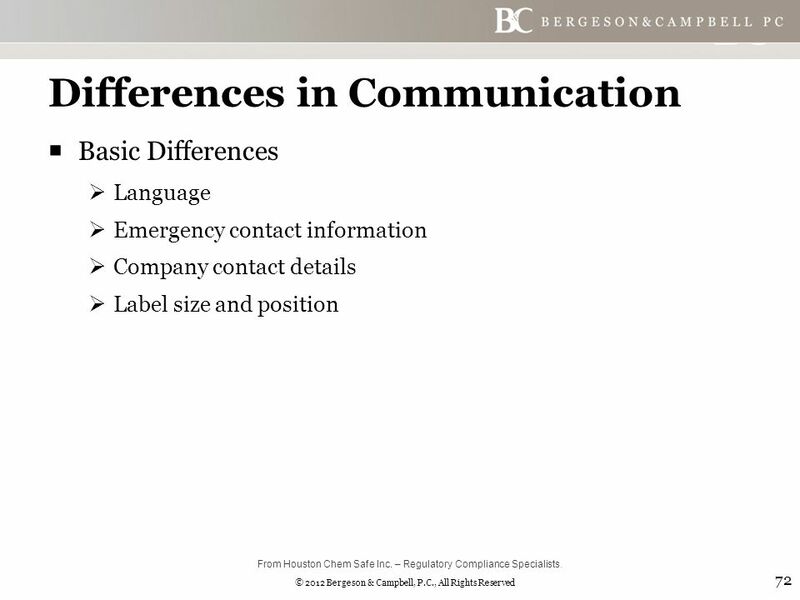 4 © 2012 Bergeson & Campbell, P.C., All Rights Reserved © 2012 Bergeson & Campbell, PC. All Rights Reserved. 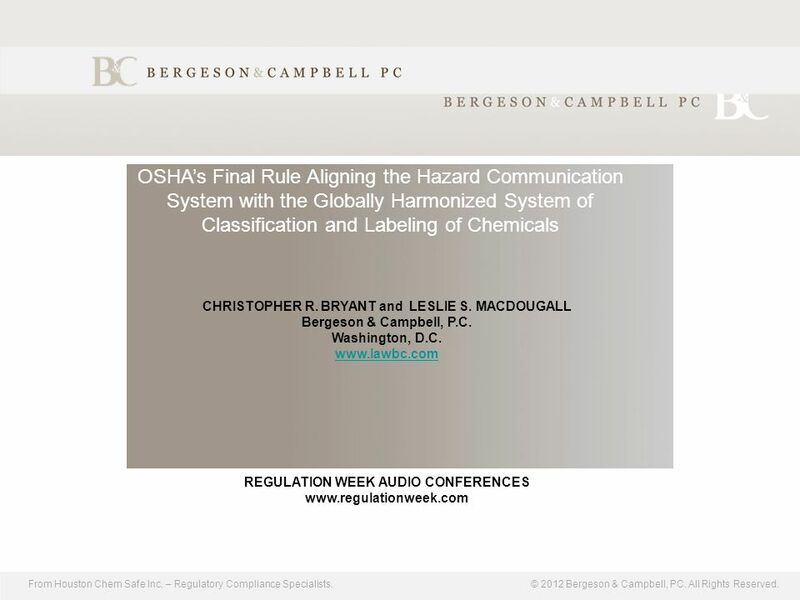 OSHA’s Final Rule Aligning the Hazard Communication System with the Globally Harmonized System of Classification and Labeling of Chemicals CHRISTOPHER R. BRYANT and LESLIE S. MACDOUGALL Bergeson & Campbell, P.C. Washington, D.C. www.lawbc.com REGULATION WEEK AUDIO CONFERENCES www.regulationweek.com From Houston Chem Safe Inc. – Regulatory Compliance Specialists. 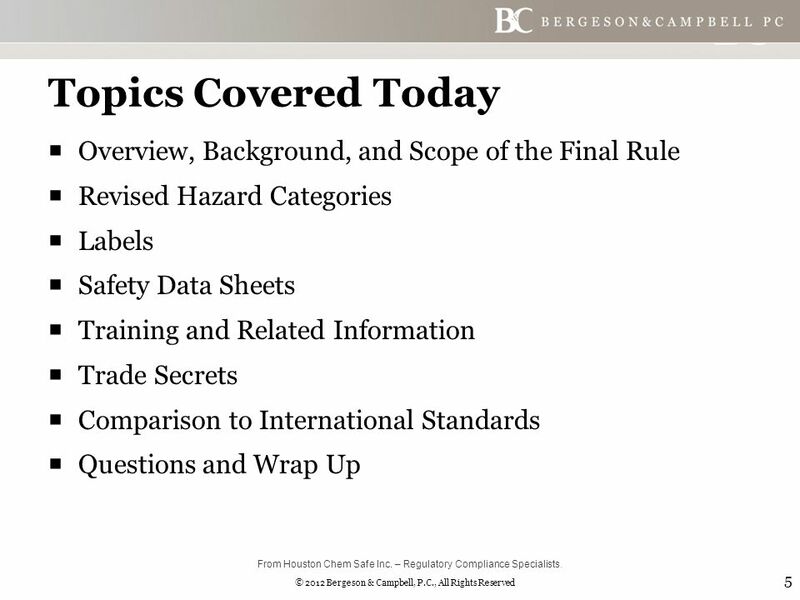 5 © 2012 Bergeson & Campbell, P.C., All Rights Reserved Topics Covered Today  Overview, Background, and Scope of the Final Rule  Revised Hazard Categories  Labels  Safety Data Sheets  Training and Related Information  Trade Secrets  Comparison to International Standards  Questions and Wrap Up 5 From Houston Chem Safe Inc. – Regulatory Compliance Specialists. 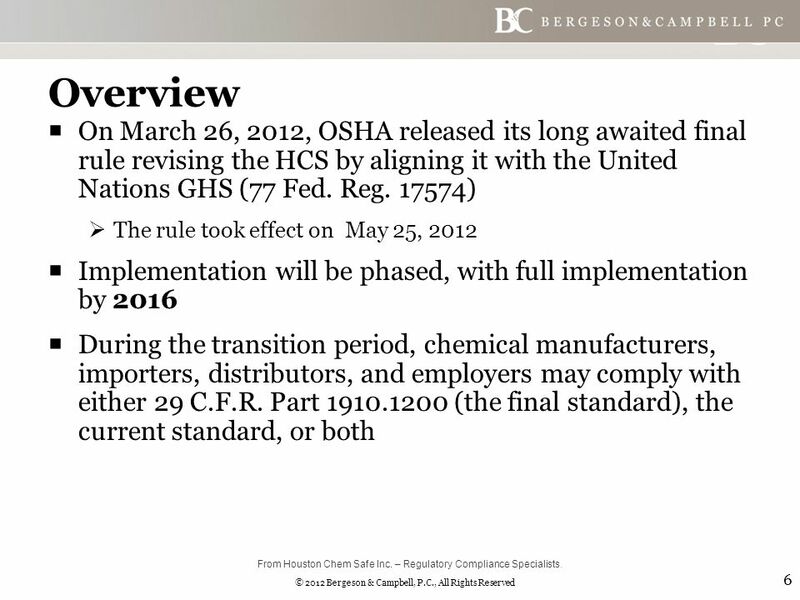 6 © 2012 Bergeson & Campbell, P.C., All Rights Reserved Overview  On March 26, 2012, OSHA released its long awaited final rule revising the HCS by aligning it with the United Nations GHS (77 Fed. Reg. 17574)  The rule took effect on May 25, 2012  Implementation will be phased, with full implementation by 2016  During the transition period, chemical manufacturers, importers, distributors, and employers may comply with either 29 C.F.R. Part 1910.1200 (the final standard), the current standard, or both 6 From Houston Chem Safe Inc. – Regulatory Compliance Specialists. 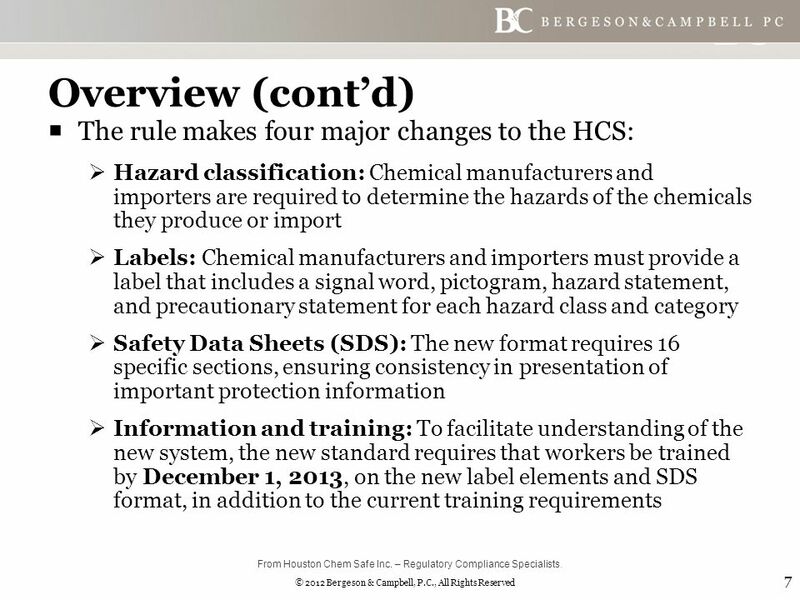 7 © 2012 Bergeson & Campbell, P.C., All Rights Reserved Overview (cont’d)  The rule makes four major changes to the HCS:  Hazard classification: Chemical manufacturers and importers are required to determine the hazards of the chemicals they produce or import  Labels: Chemical manufacturers and importers must provide a label that includes a signal word, pictogram, hazard statement, and precautionary statement for each hazard class and category  Safety Data Sheets (SDS): The new format requires 16 specific sections, ensuring consistency in presentation of important protection information  Information and training: To facilitate understanding of the new system, the new standard requires that workers be trained by December 1, 2013, on the new label elements and SDS format, in addition to the current training requirements 7 From Houston Chem Safe Inc. – Regulatory Compliance Specialists. 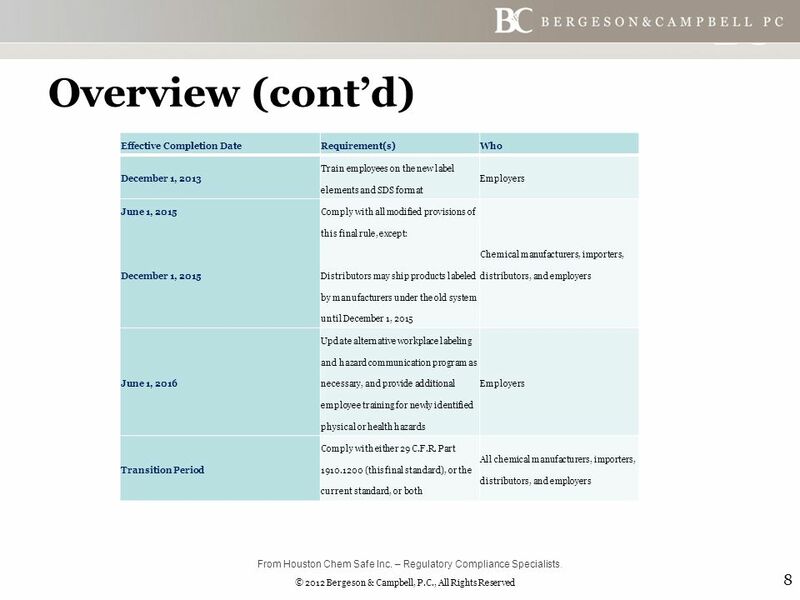 8 © 2012 Bergeson & Campbell, P.C., All Rights Reserved Overview (cont’d) Effective Completion DateRequirement(s)Who December 1, 2013 Train employees on the new label elements and SDS format Employers June 1, 2015 December 1, 2015 Comply with all modified provisions of this final rule, except: Distributors may ship products labeled by manufacturers under the old system until December 1, 2015 Chemical manufacturers, importers, distributors, and employers June 1, 2016 Update alternative workplace labeling and hazard communication program as necessary, and provide additional employee training for newly identified physical or health hazards Employers Transition Period Comply with either 29 C.F.R. Part 1910.1200 (this final standard), or the current standard, or both All chemical manufacturers, importers, distributors, and employers 8 From Houston Chem Safe Inc. – Regulatory Compliance Specialists. 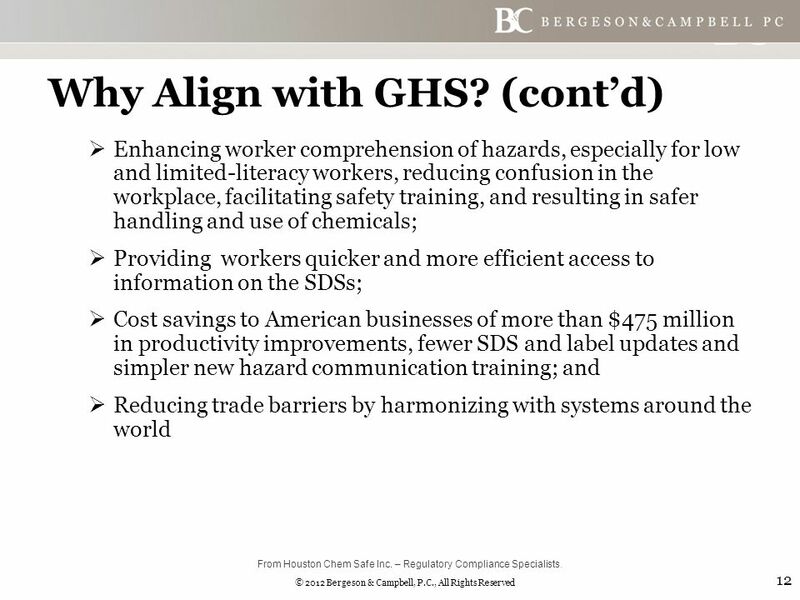 9 © 2012 Bergeson & Campbell, P.C., All Rights Reserved Why Align with GHS?  Complying with myriad, multi-jurisdictional regulations on chemical hazard communication can be a burden for manufacturers, importers, transporters, and distributors  This burden is magnified by the need to develop multiple sets of labels and SDSs for each product in international trade  OSHA first recognized the problems associated with differing national and international requirements when it issued the original HCS in 1983, when OSHA also noted the benefits of global harmonization and committed to reviewing its rules to ensure consistency with global standards 9 From Houston Chem Safe Inc. – Regulatory Compliance Specialists. 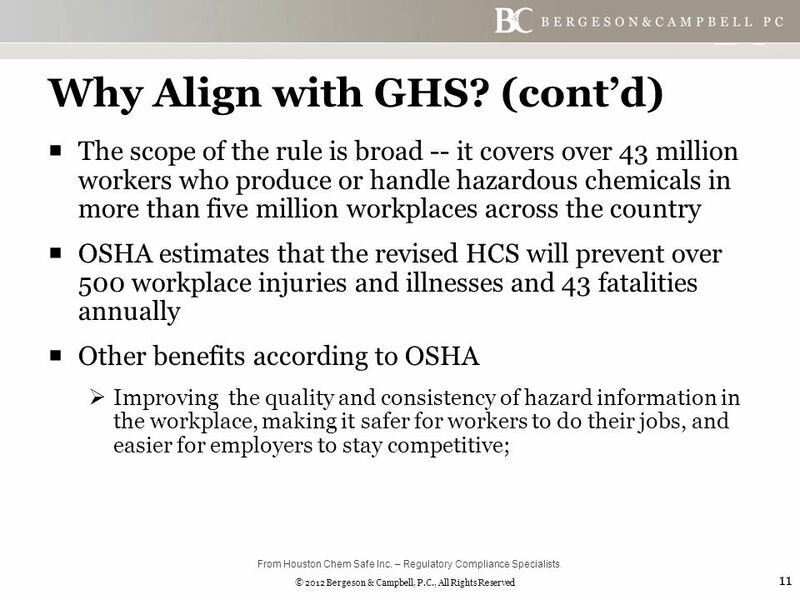 10 © 2012 Bergeson & Campbell, P.C., All Rights Reserved Why Align with GHS? 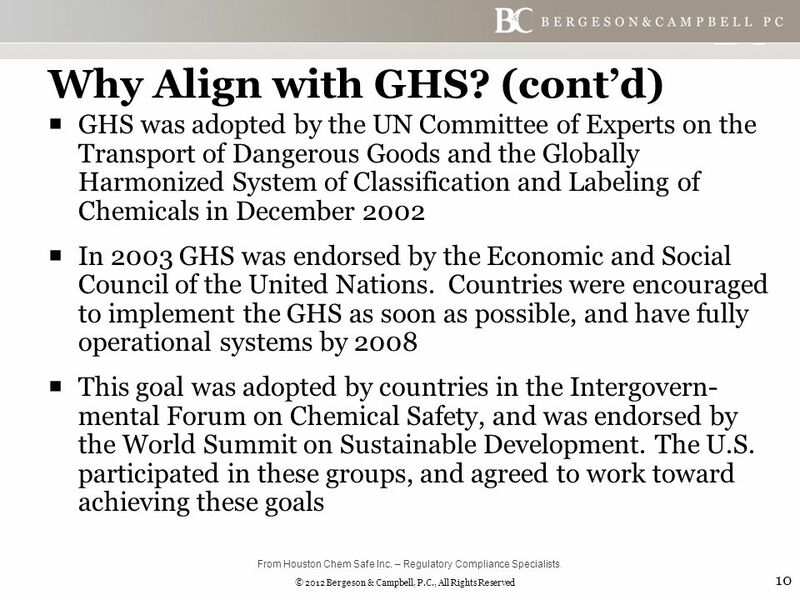 (cont’d)  GHS was adopted by the UN Committee of Experts on the Transport of Dangerous Goods and the Globally Harmonized System of Classification and Labeling of Chemicals in December 2002  In 2003 GHS was endorsed by the Economic and Social Council of the United Nations. Countries were encouraged to implement the GHS as soon as possible, and have fully operational systems by 2008  This goal was adopted by countries in the Intergovern- mental Forum on Chemical Safety, and was endorsed by the World Summit on Sustainable Development. The U.S. participated in these groups, and agreed to work toward achieving these goals 10 From Houston Chem Safe Inc. – Regulatory Compliance Specialists. 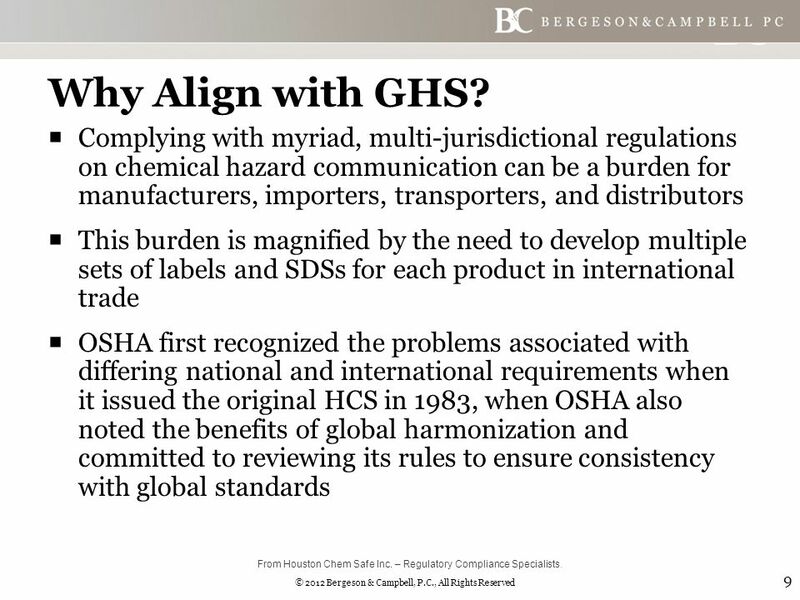 11 © 2012 Bergeson & Campbell, P.C., All Rights Reserved Why Align with GHS? (cont’d)  The scope of the rule is broad -- it covers over 43 million workers who produce or handle hazardous chemicals in more than five million workplaces across the country  OSHA estimates that the revised HCS will prevent over 500 workplace injuries and illnesses and 43 fatalities annually  Other benefits according to OSHA  Improving the quality and consistency of hazard information in the workplace, making it safer for workers to do their jobs, and easier for employers to stay competitive; 11 From Houston Chem Safe Inc. – Regulatory Compliance Specialists. 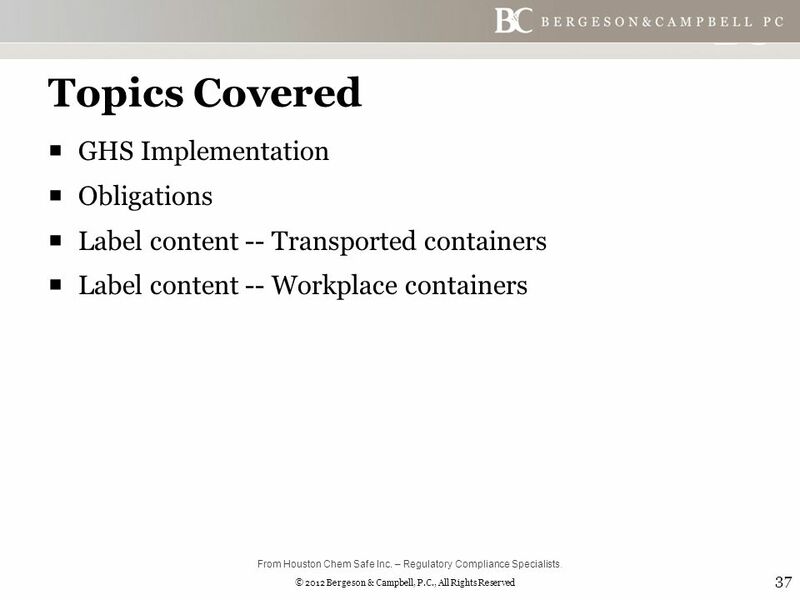 12 © 2012 Bergeson & Campbell, P.C., All Rights Reserved Why Align with GHS? (cont’d)  Enhancing worker comprehension of hazards, especially for low and limited-literacy workers, reducing confusion in the workplace, facilitating safety training, and resulting in safer handling and use of chemicals;  Providing workers quicker and more efficient access to information on the SDSs;  Cost savings to American businesses of more than $475 million in productivity improvements, fewer SDS and label updates and simpler new hazard communication training; and  Reducing trade barriers by harmonizing with systems around the world 12 From Houston Chem Safe Inc. – Regulatory Compliance Specialists. 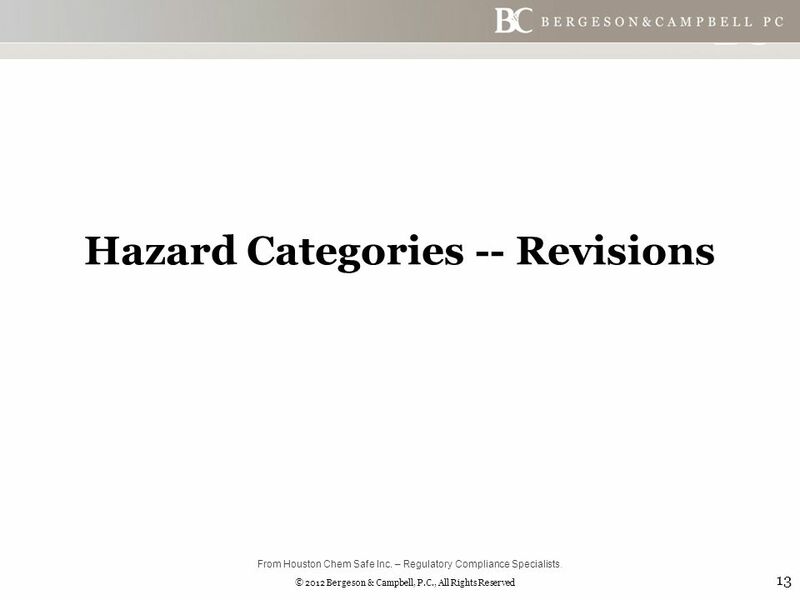 13 © 2012 Bergeson & Campbell, P.C., All Rights Reserved Hazard Categories -- Revisions 13 From Houston Chem Safe Inc. – Regulatory Compliance Specialists. 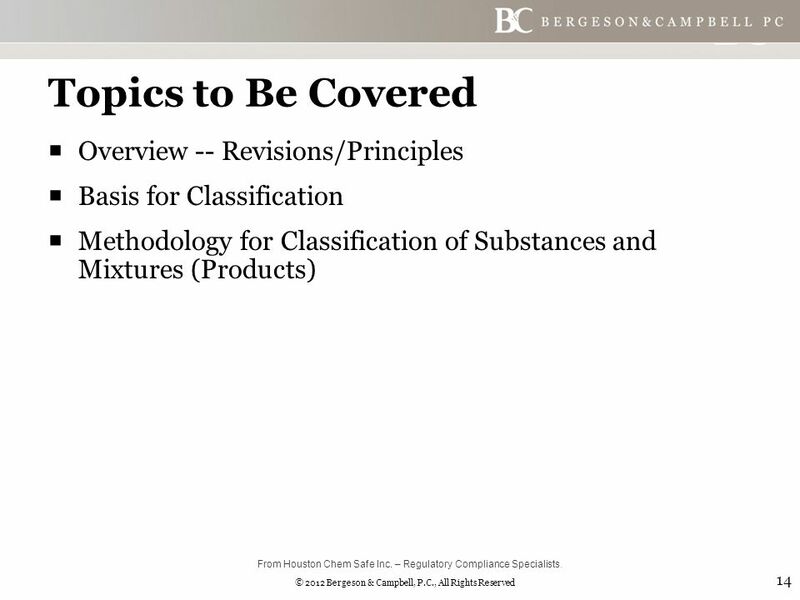 14 © 2012 Bergeson & Campbell, P.C., All Rights Reserved Topics to Be Covered  Overview -- Revisions/Principles  Basis for Classification  Methodology for Classification of Substances and Mixtures (Products) 14 From Houston Chem Safe Inc. – Regulatory Compliance Specialists. 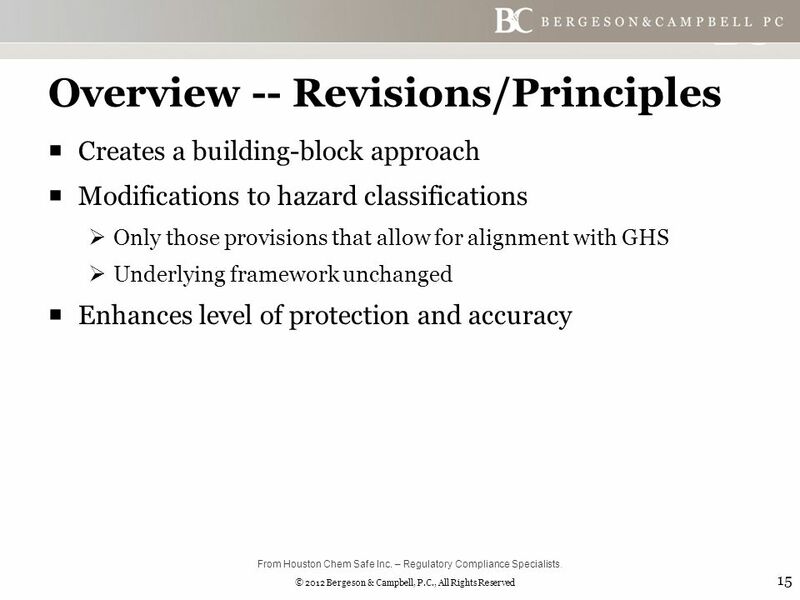 15 © 2012 Bergeson & Campbell, P.C., All Rights Reserved Overview -- Revisions/Principles  Creates a building-block approach  Modifications to hazard classifications  Only those provisions that allow for alignment with GHS  Underlying framework unchanged  Enhances level of protection and accuracy 15 From Houston Chem Safe Inc. – Regulatory Compliance Specialists. 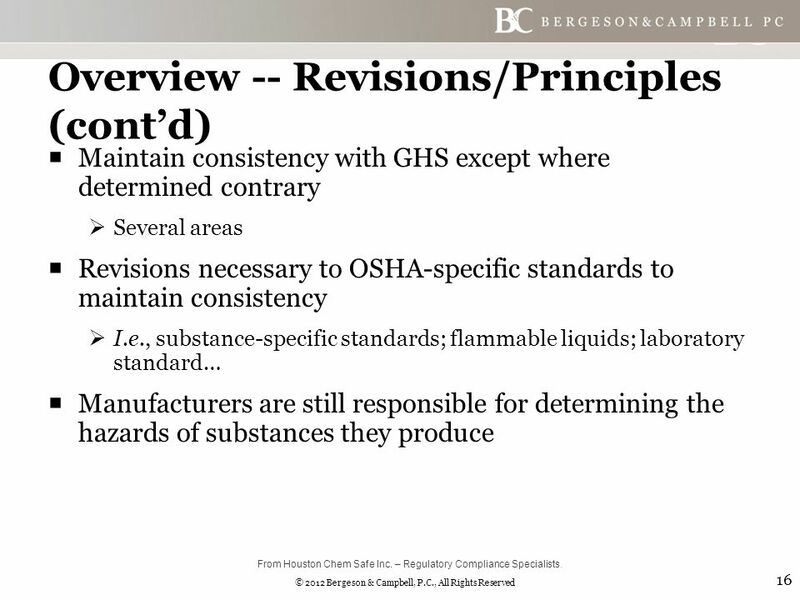 16 © 2012 Bergeson & Campbell, P.C., All Rights Reserved Overview -- Revisions/Principles (cont’d)  Maintain consistency with GHS except where determined contrary  Several areas  Revisions necessary to OSHA-specific standards to maintain consistency  I.e., substance-specific standards; flammable liquids; laboratory standard…  Manufacturers are still responsible for determining the hazards of substances they produce 16 From Houston Chem Safe Inc. – Regulatory Compliance Specialists. 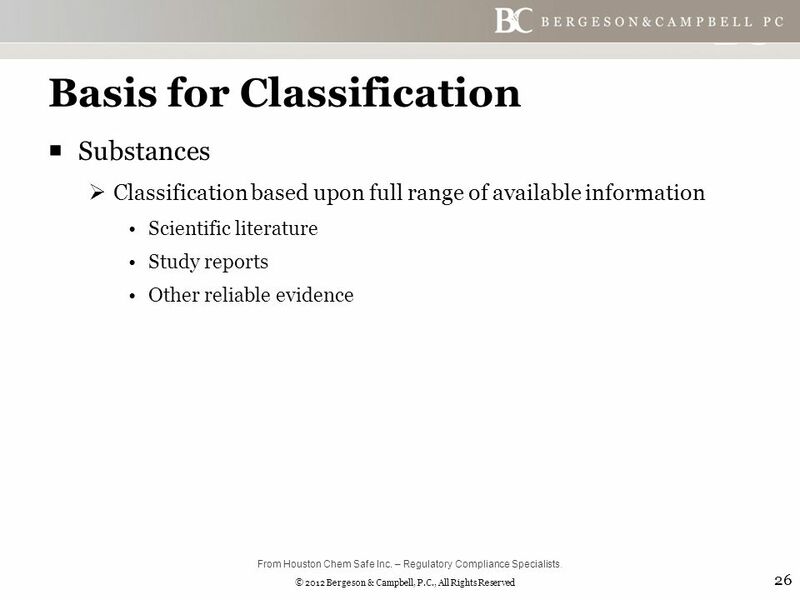 17 © 2012 Bergeson & Campbell, P.C., All Rights Reserved Overview -- Revisions/Principles (cont’d)  Classification should be based on ALL available information  Can and should determine if the manufacturer accurately classifies the substance/mixture  Can modify classification provided by manufacturer provided that it can be supported that the SDS misstates or omits required information 17 From Houston Chem Safe Inc. – Regulatory Compliance Specialists. 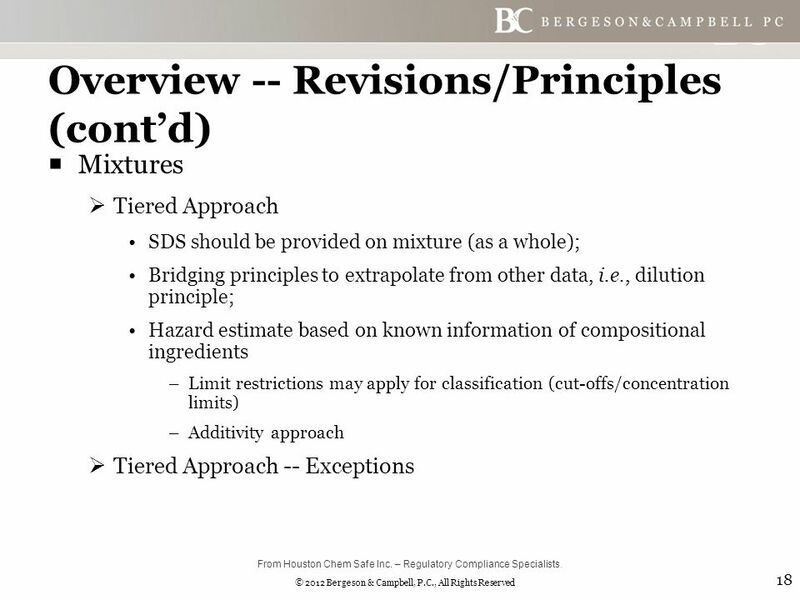 18 © 2012 Bergeson & Campbell, P.C., All Rights Reserved Overview -- Revisions/Principles (cont’d)  Mixtures  Tiered Approach SDS should be provided on mixture (as a whole); Bridging principles to extrapolate from other data, i.e., dilution principle; Hazard estimate based on known information of compositional ingredients –Limit restrictions may apply for classification (cut-offs/concentration limits) –Additivity approach  Tiered Approach -- Exceptions 18 From Houston Chem Safe Inc. – Regulatory Compliance Specialists. 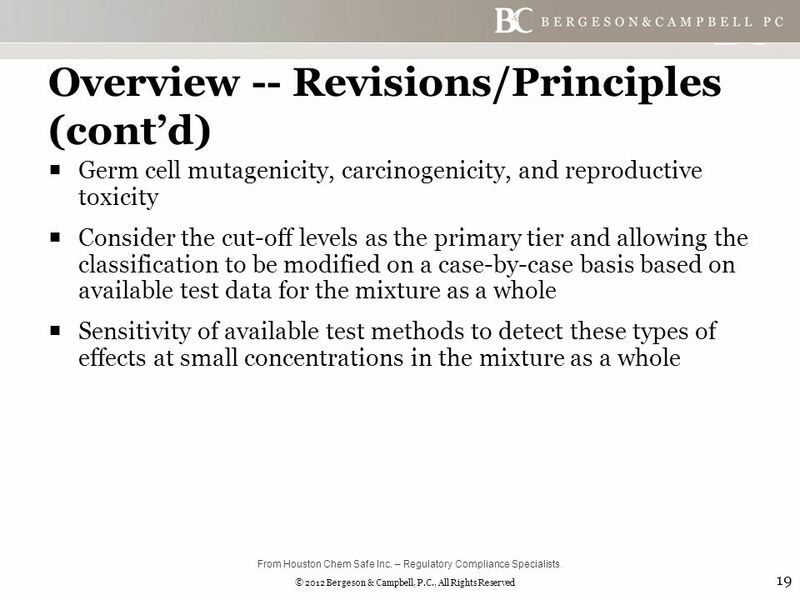 19 © 2012 Bergeson & Campbell, P.C., All Rights Reserved Overview -- Revisions/Principles (cont’d)  Germ cell mutagenicity, carcinogenicity, and reproductive toxicity  Consider the cut-off levels as the primary tier and allowing the classification to be modified on a case-by-case basis based on available test data for the mixture as a whole  Sensitivity of available test methods to detect these types of effects at small concentrations in the mixture as a whole 19 From Houston Chem Safe Inc. – Regulatory Compliance Specialists. 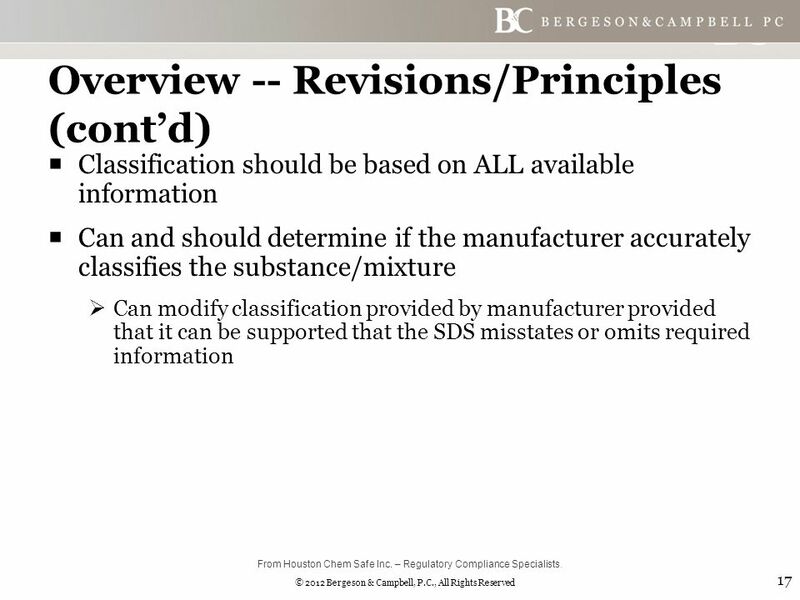 20 © 2012 Bergeson & Campbell, P.C., All Rights Reserved Overview -- Revisions/Principles (cont’d)  As with substance SDS -- information in the substance SDS can be relied upon unless it is known that the SDS misstates or omits required information 20 From Houston Chem Safe Inc. – Regulatory Compliance Specialists. 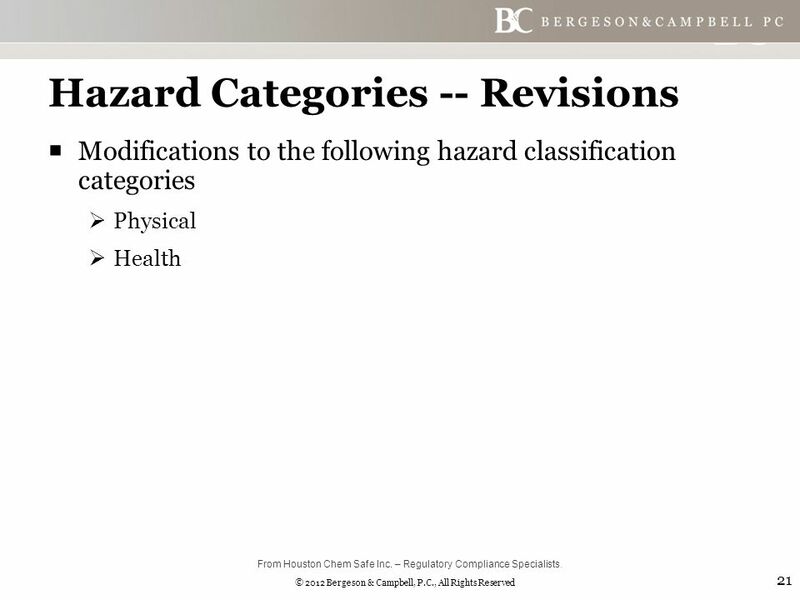 21 © 2012 Bergeson & Campbell, P.C., All Rights Reserved Hazard Categories -- Revisions  Modifications to the following hazard classification categories  Physical  Health 21 From Houston Chem Safe Inc. – Regulatory Compliance Specialists. 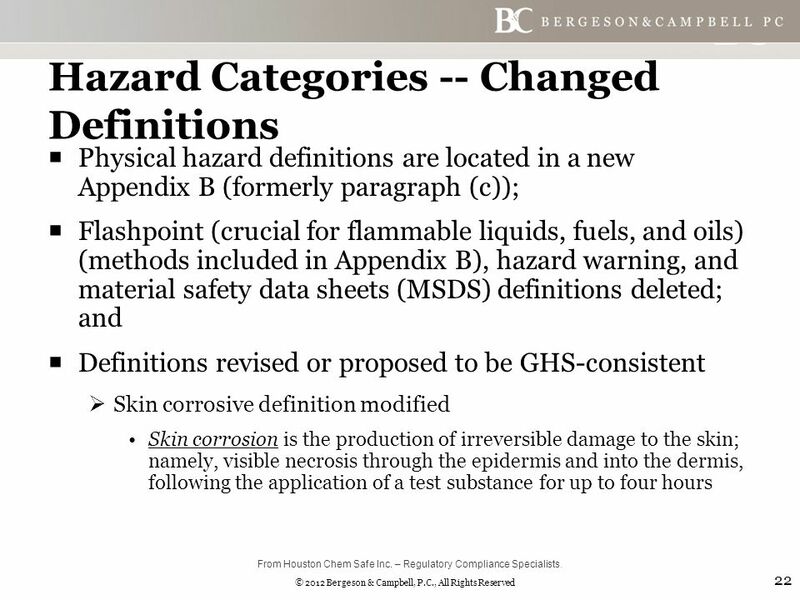 22 © 2012 Bergeson & Campbell, P.C., All Rights Reserved Hazard Categories -- Changed Definitions  Physical hazard definitions are located in a new Appendix B (formerly paragraph (c));  Flashpoint (crucial for flammable liquids, fuels, and oils) (methods included in Appendix B), hazard warning, and material safety data sheets (MSDS) definitions deleted; and  Definitions revised or proposed to be GHS-consistent  Skin corrosive definition modified Skin corrosion is the production of irreversible damage to the skin; namely, visible necrosis through the epidermis and into the dermis, following the application of a test substance for up to four hours 22 From Houston Chem Safe Inc. – Regulatory Compliance Specialists. 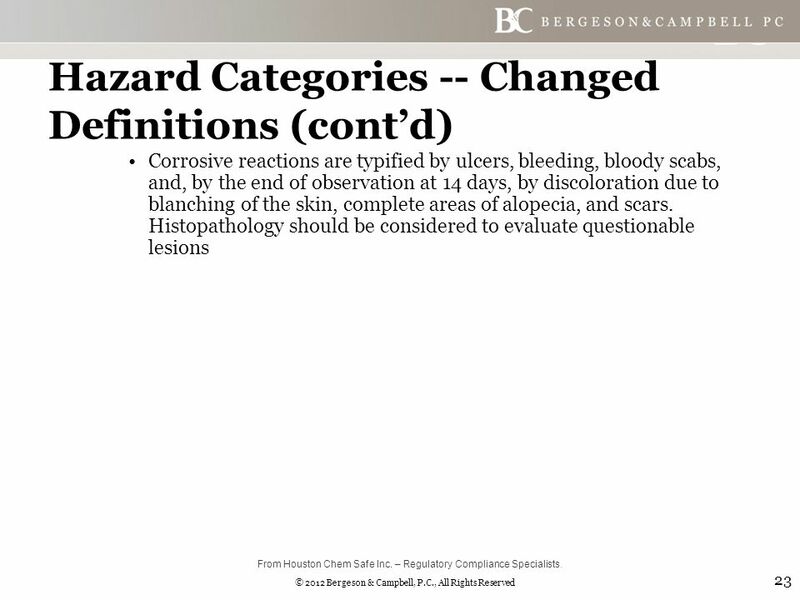 23 © 2012 Bergeson & Campbell, P.C., All Rights Reserved Hazard Categories -- Changed Definitions (cont’d) Corrosive reactions are typified by ulcers, bleeding, bloody scabs, and, by the end of observation at 14 days, by discoloration due to blanching of the skin, complete areas of alopecia, and scars. Histopathology should be considered to evaluate questionable lesions 23 From Houston Chem Safe Inc. – Regulatory Compliance Specialists. 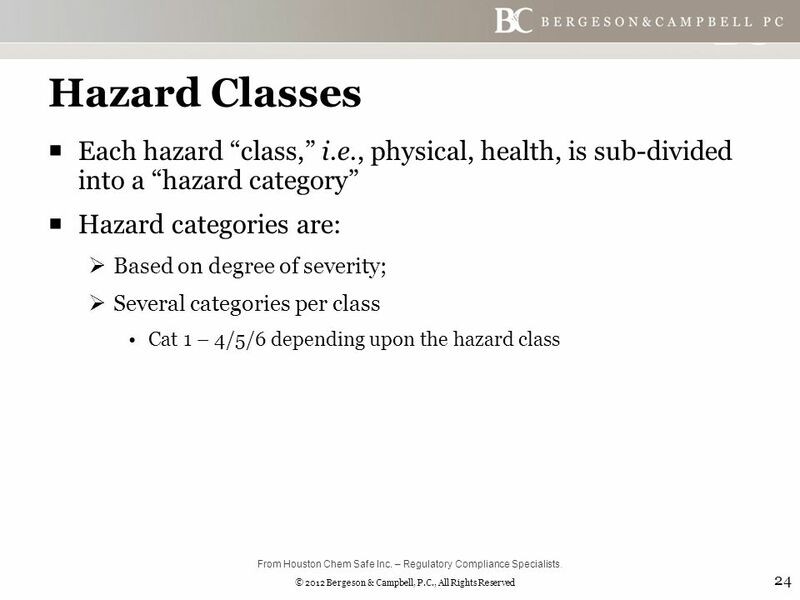 24 © 2012 Bergeson & Campbell, P.C., All Rights Reserved Hazard Classes  Each hazard “class,” i.e., physical, health, is sub-divided into a “hazard category”  Hazard categories are:  Based on degree of severity;  Several categories per class Cat 1 – 4/5/6 depending upon the hazard class 24 From Houston Chem Safe Inc. – Regulatory Compliance Specialists. 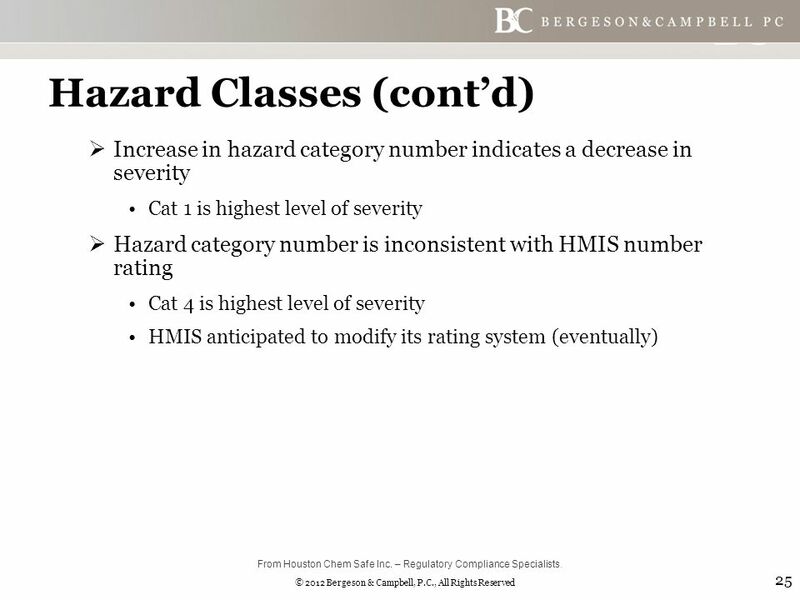 25 © 2012 Bergeson & Campbell, P.C., All Rights Reserved Hazard Classes (cont’d)  Increase in hazard category number indicates a decrease in severity Cat 1 is highest level of severity  Hazard category number is inconsistent with HMIS number rating Cat 4 is highest level of severity HMIS anticipated to modify its rating system (eventually) 25 From Houston Chem Safe Inc. – Regulatory Compliance Specialists. 26 © 2012 Bergeson & Campbell, P.C., All Rights Reserved Basis for Classification  Substances  Classification based upon full range of available information Scientific literature Study reports Other reliable evidence 26 From Houston Chem Safe Inc. – Regulatory Compliance Specialists. 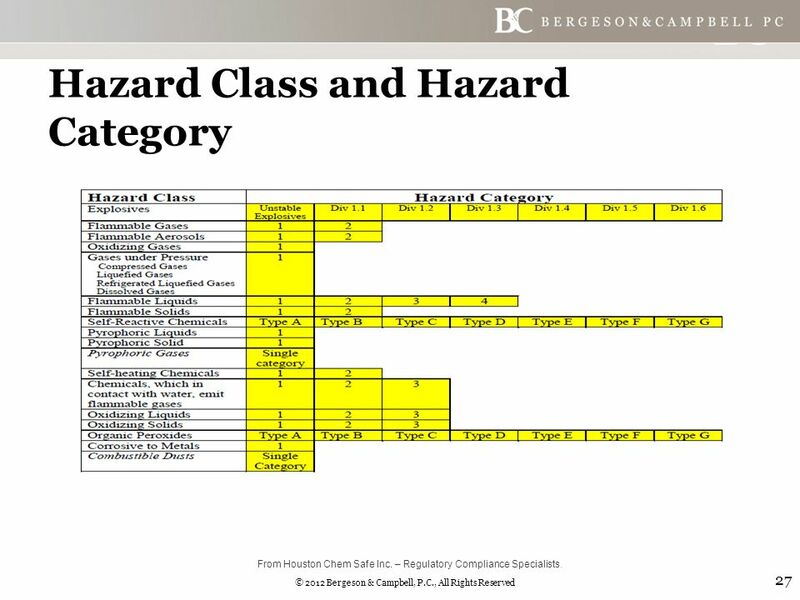 27 © 2012 Bergeson & Campbell, P.C., All Rights Reserved Hazard Class and Hazard Category 27 From Houston Chem Safe Inc. – Regulatory Compliance Specialists. 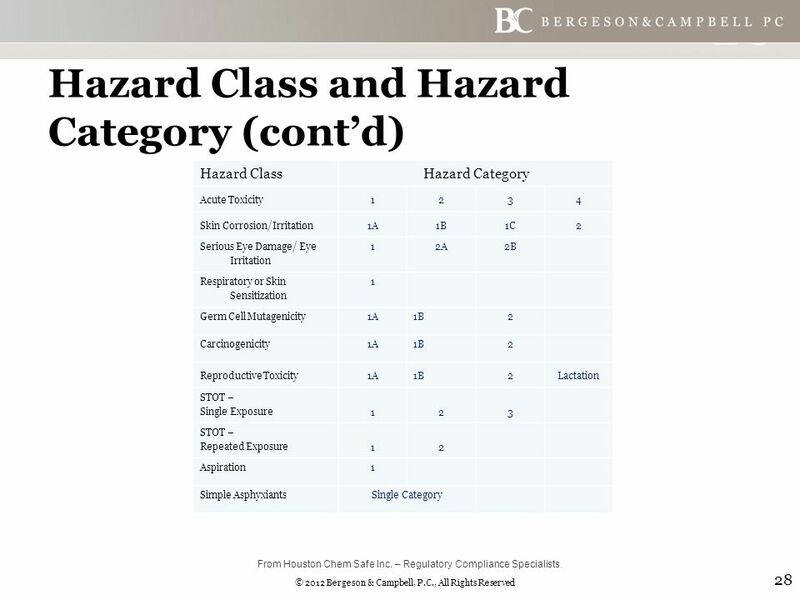 28 © 2012 Bergeson & Campbell, P.C., All Rights Reserved Hazard Class and Hazard Category (cont’d) 28 Hazard ClassHazard Category Acute Toxicity1234 Skin Corrosion/Irritation1A1B1C2 Serious Eye Damage/ Eye Irritation 12A2B Respiratory or Skin Sensitization 1 Germ Cell Mutagenicity1A1B2 Carcinogenicity1A1B2 Reproductive Toxicity1A1B2Lactation STOT – Single Exposure 123 STOT – Repeated Exposure 12 Aspiration1 Simple AsphyxiantsSingle Category From Houston Chem Safe Inc. – Regulatory Compliance Specialists. 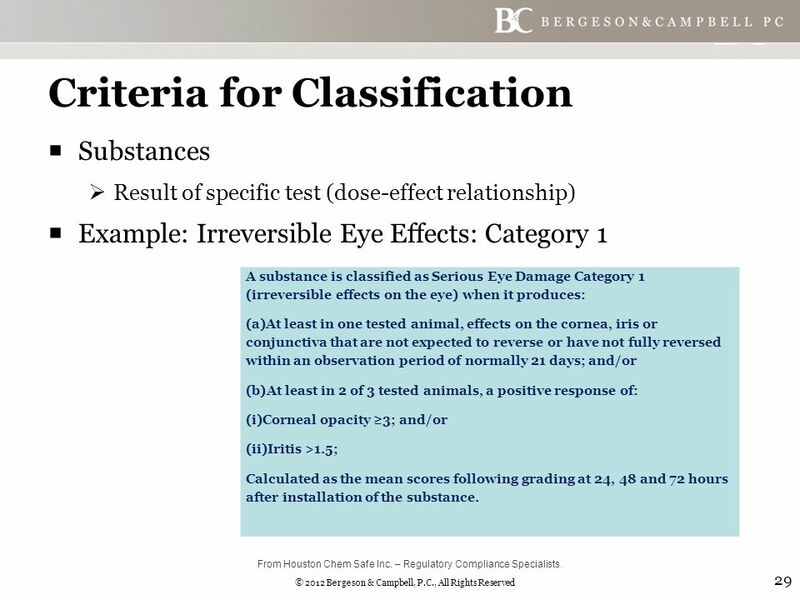 29 © 2012 Bergeson & Campbell, P.C., All Rights Reserved Criteria for Classification  Substances  Result of specific test (dose-effect relationship)  Example: Irreversible Eye Effects: Category 1 29 A substance is classified as Serious Eye Damage Category 1 (irreversible effects on the eye) when it produces: (a)At least in one tested animal, effects on the cornea, iris or conjunctiva that are not expected to reverse or have not fully reversed within an observation period of normally 21 days; and/or (b)At least in 2 of 3 tested animals, a positive response of: (i)Corneal opacity ≥3; and/or (ii)Iritis >1.5; Calculated as the mean scores following grading at 24, 48 and 72 hours after installation of the substance. From Houston Chem Safe Inc. – Regulatory Compliance Specialists. 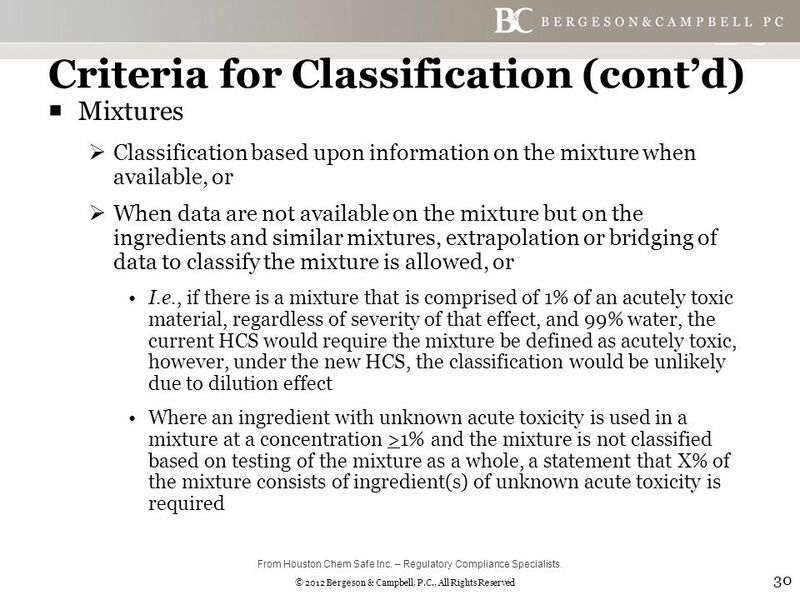 30 © 2012 Bergeson & Campbell, P.C., All Rights Reserved Criteria for Classification (cont’d)  Mixtures  Classification based upon information on the mixture when available, or  When data are not available on the mixture but on the ingredients and similar mixtures, extrapolation or bridging of data to classify the mixture is allowed, or I.e., if there is a mixture that is comprised of 1% of an acutely toxic material, regardless of severity of that effect, and 99% water, the current HCS would require the mixture be defined as acutely toxic, however, under the new HCS, the classification would be unlikely due to dilution effect Where an ingredient with unknown acute toxicity is used in a mixture at a concentration >1% and the mixture is not classified based on testing of the mixture as a whole, a statement that X% of the mixture consists of ingredient(s) of unknown acute toxicity is required 30 From Houston Chem Safe Inc. – Regulatory Compliance Specialists. 31 © 2012 Bergeson & Campbell, P.C., All Rights Reserved Criteria for Classification (cont’d)  Classification based upon the classification of some constituent substances based on cut-offs (concentration limits) specific to the hazard or additivity  Additivity approach 31 Sum of ingredients classified as: Skin corrosive Category 1 Skin Irritant Category 2 Skin Category 1>5%≥1% but <5% Skin Category 2 ≥10% (10 x Skin Category 1) + Skin Category 2 ≥10% From Houston Chem Safe Inc. – Regulatory Compliance Specialists. 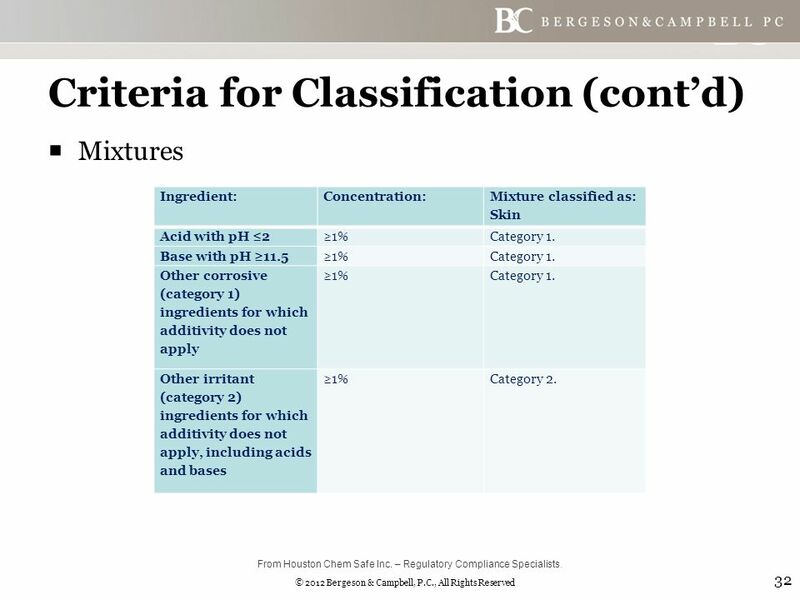 32 © 2012 Bergeson & Campbell, P.C., All Rights Reserved Criteria for Classification (cont’d)  Mixtures 32 Ingredient:Concentration: Mixture classified as: Skin Acid with pH ≤2≥1%Category 1. Base with pH ≥11.5≥1%Category 1. Other corrosive (category 1) ingredients for which additivity does not apply ≥1%Category 1. Other irritant (category 2) ingredients for which additivity does not apply, including acids and bases ≥1%Category 2. From Houston Chem Safe Inc. – Regulatory Compliance Specialists. 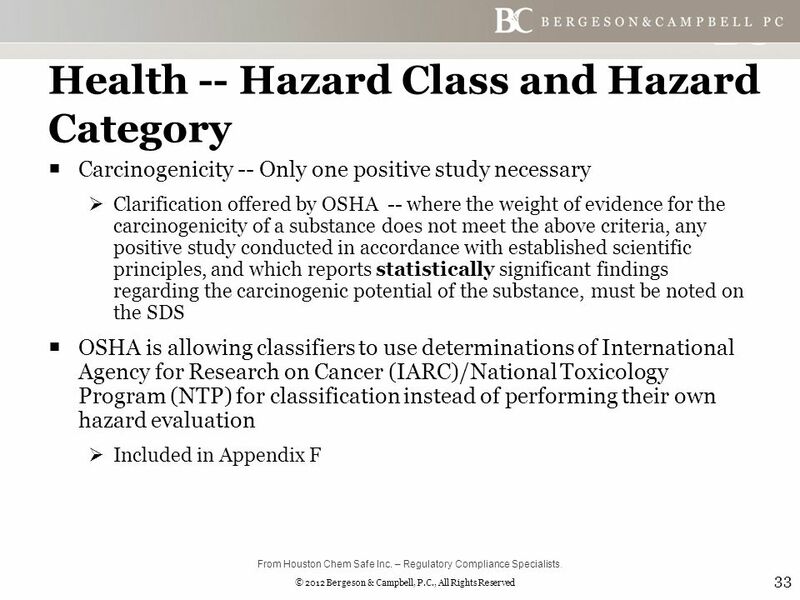 33 © 2012 Bergeson & Campbell, P.C., All Rights Reserved Health -- Hazard Class and Hazard Category  Carcinogenicity -- Only one positive study necessary  Clarification offered by OSHA -- where the weight of evidence for the carcinogenicity of a substance does not meet the above criteria, any positive study conducted in accordance with established scientific principles, and which reports statistically significant findings regarding the carcinogenic potential of the substance, must be noted on the SDS  OSHA is allowing classifiers to use determinations of International Agency for Research on Cancer (IARC)/National Toxicology Program (NTP) for classification instead of performing their own hazard evaluation  Included in Appendix F 33 From Houston Chem Safe Inc. – Regulatory Compliance Specialists. 34 © 2012 Bergeson & Campbell, P.C., All Rights Reserved Environmental  Not OSHA’s mandate  No environmental categories defined by OSHA HCS 34 From Houston Chem Safe Inc. – Regulatory Compliance Specialists. 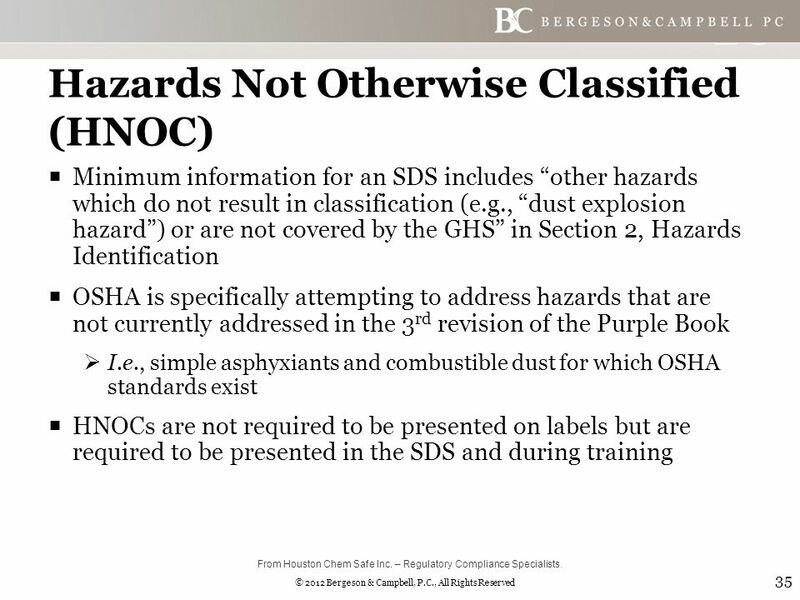 35 © 2012 Bergeson & Campbell, P.C., All Rights Reserved Hazards Not Otherwise Classified (HNOC)  Minimum information for an SDS includes “other hazards which do not result in classification (e.g., “dust explosion hazard”) or are not covered by the GHS” in Section 2, Hazards Identification  OSHA is specifically attempting to address hazards that are not currently addressed in the 3 rd revision of the Purple Book  I.e., simple asphyxiants and combustible dust for which OSHA standards exist  HNOCs are not required to be presented on labels but are required to be presented in the SDS and during training 35 From Houston Chem Safe Inc. – Regulatory Compliance Specialists. 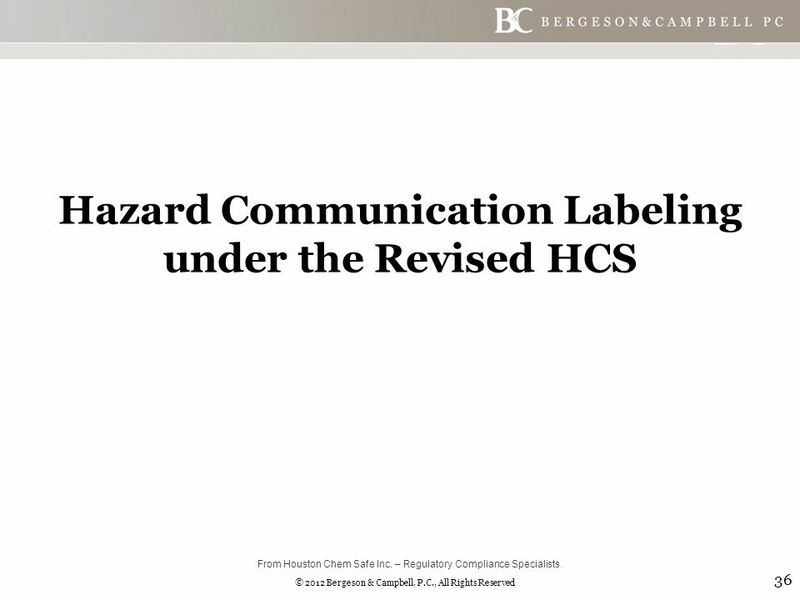 36 © 2012 Bergeson & Campbell, P.C., All Rights Reserved Hazard Communication Labeling under the Revised HCS 36 From Houston Chem Safe Inc. – Regulatory Compliance Specialists. 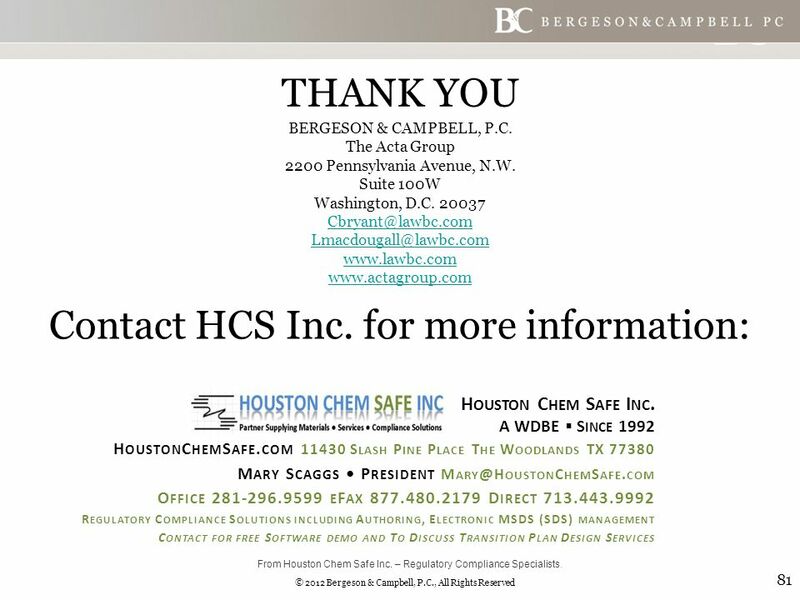 37 © 2012 Bergeson & Campbell, P.C., All Rights Reserved Topics Covered  GHS Implementation  Obligations  Label content -- Transported containers  Label content -- Workplace containers 37 From Houston Chem Safe Inc. – Regulatory Compliance Specialists. 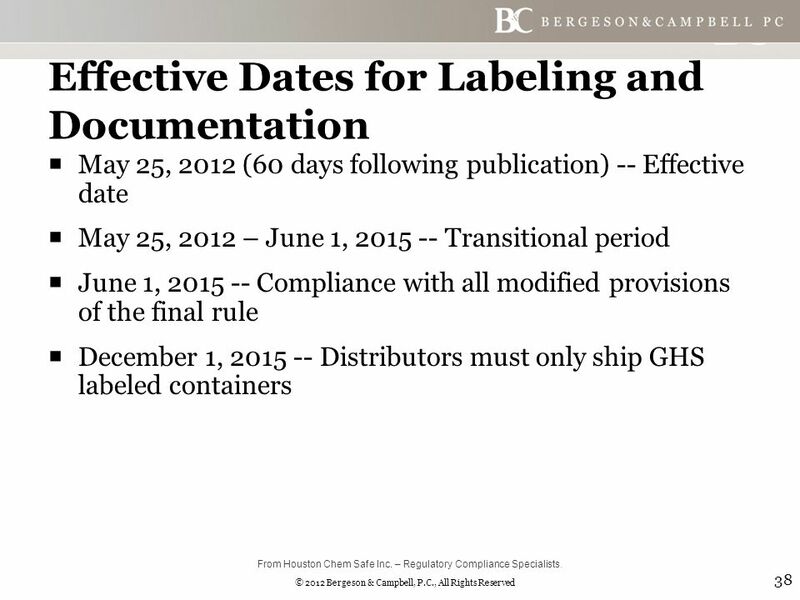 38 © 2012 Bergeson & Campbell, P.C., All Rights Reserved Effective Dates for Labeling and Documentation  May 25, 2012 (60 days following publication) -- Effective date  May 25, 2012 – June 1, 2015 -- Transitional period  June 1, 2015 -- Compliance with all modified provisions of the final rule  December 1, 2015 -- Distributors must only ship GHS labeled containers 38 From Houston Chem Safe Inc. – Regulatory Compliance Specialists. 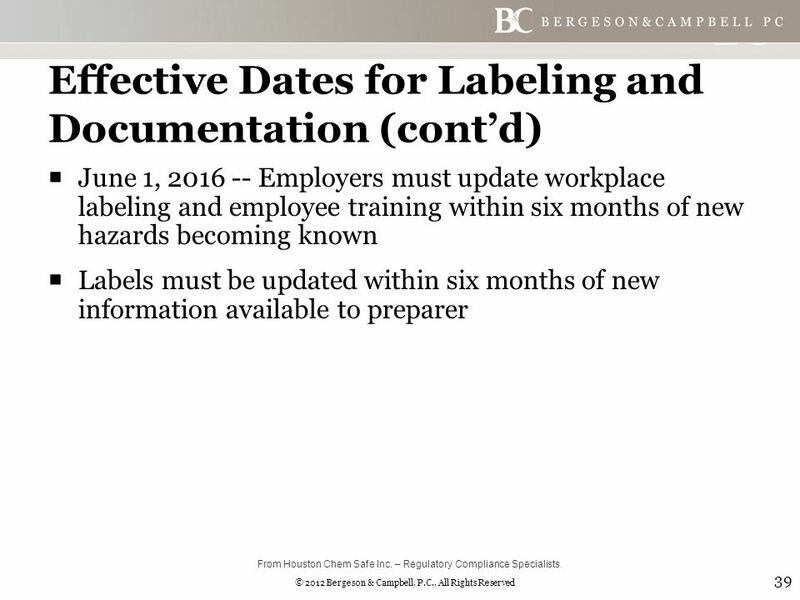 39 © 2012 Bergeson & Campbell, P.C., All Rights Reserved Effective Dates for Labeling and Documentation (cont’d)  June 1, 2016 -- Employers must update workplace labeling and employee training within six months of new hazards becoming known  Labels must be updated within six months of new information available to preparer 39 From Houston Chem Safe Inc. – Regulatory Compliance Specialists. 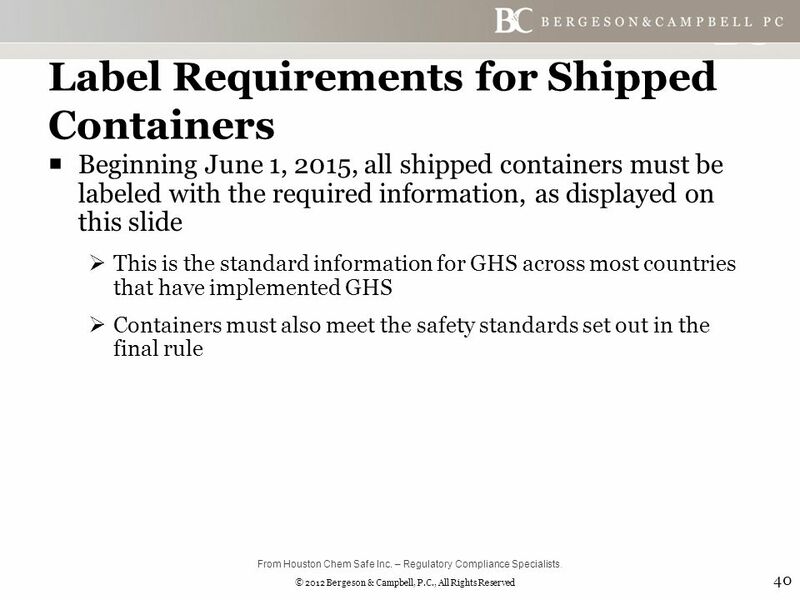 40 © 2012 Bergeson & Campbell, P.C., All Rights Reserved Label Requirements for Shipped Containers  Beginning June 1, 2015, all shipped containers must be labeled with the required information, as displayed on this slide  This is the standard information for GHS across most countries that have implemented GHS  Containers must also meet the safety standards set out in the final rule 40 From Houston Chem Safe Inc. – Regulatory Compliance Specialists. 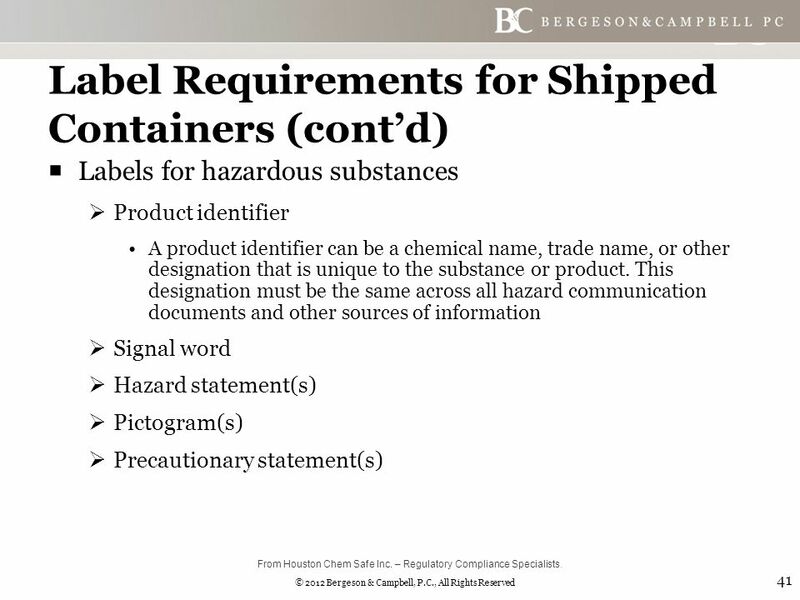 41 © 2012 Bergeson & Campbell, P.C., All Rights Reserved Label Requirements for Shipped Containers (cont’d)  Labels for hazardous substances  Product identifier A product identifier can be a chemical name, trade name, or other designation that is unique to the substance or product. This designation must be the same across all hazard communication documents and other sources of information  Signal word  Hazard statement(s)  Pictogram(s)  Precautionary statement(s) 41 From Houston Chem Safe Inc. – Regulatory Compliance Specialists. 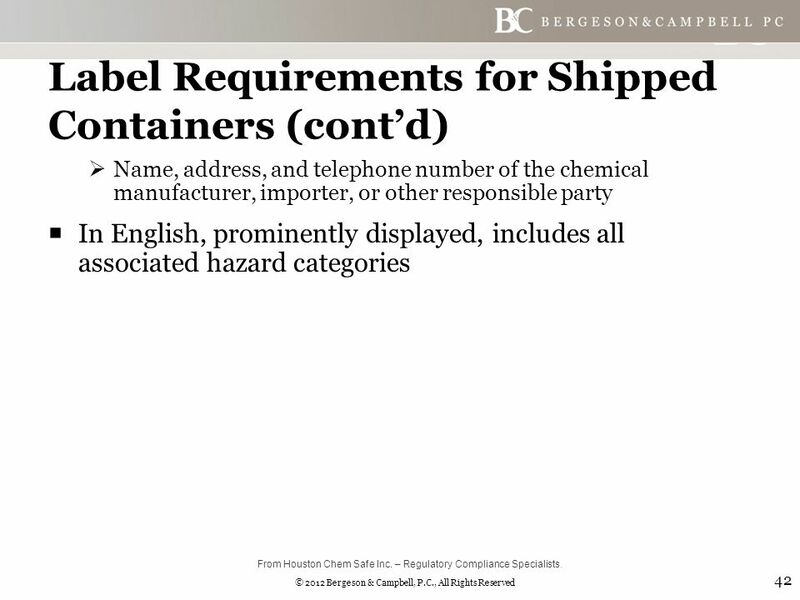 42 © 2012 Bergeson & Campbell, P.C., All Rights Reserved Label Requirements for Shipped Containers (cont’d)  Name, address, and telephone number of the chemical manufacturer, importer, or other responsible party  In English, prominently displayed, includes all associated hazard categories 42 From Houston Chem Safe Inc. – Regulatory Compliance Specialists. 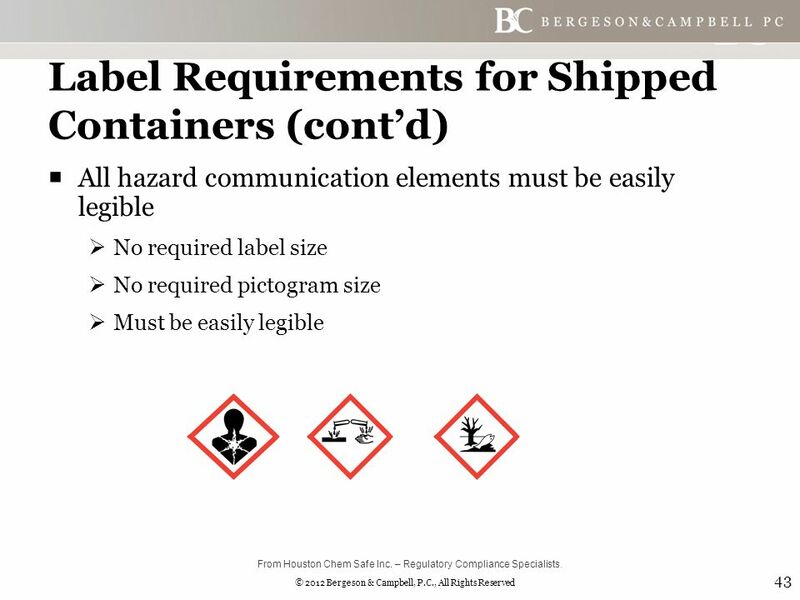 43 © 2012 Bergeson & Campbell, P.C., All Rights Reserved Label Requirements for Shipped Containers (cont’d)  All hazard communication elements must be easily legible  No required label size  No required pictogram size  Must be easily legible 43 From Houston Chem Safe Inc. – Regulatory Compliance Specialists. 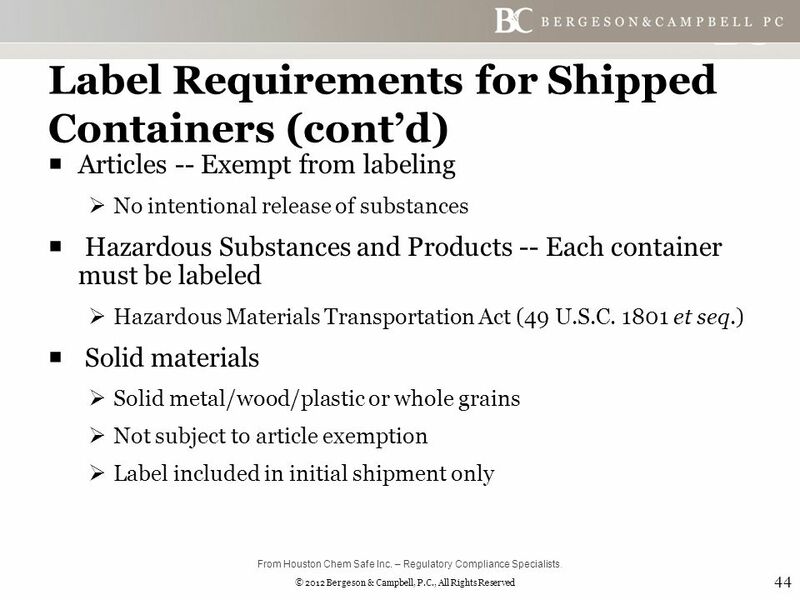 44 © 2012 Bergeson & Campbell, P.C., All Rights Reserved Label Requirements for Shipped Containers (cont’d)  Articles -- Exempt from labeling  No intentional release of substances  Hazardous Substances and Products -- Each container must be labeled  Hazardous Materials Transportation Act (49 U.S.C. 1801 et seq.)  Solid materials  Solid metal/wood/plastic or whole grains  Not subject to article exemption  Label included in initial shipment only 44 From Houston Chem Safe Inc. – Regulatory Compliance Specialists. 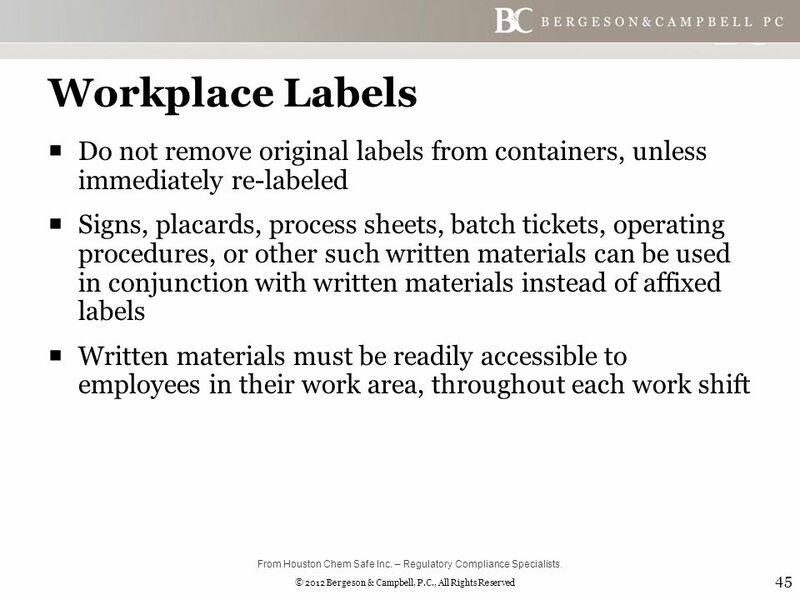 45 © 2012 Bergeson & Campbell, P.C., All Rights Reserved Workplace Labels  Do not remove original labels from containers, unless immediately re-labeled  Signs, placards, process sheets, batch tickets, operating procedures, or other such written materials can be used in conjunction with written materials instead of affixed labels  Written materials must be readily accessible to employees in their work area, throughout each work shift 45 From Houston Chem Safe Inc. – Regulatory Compliance Specialists. 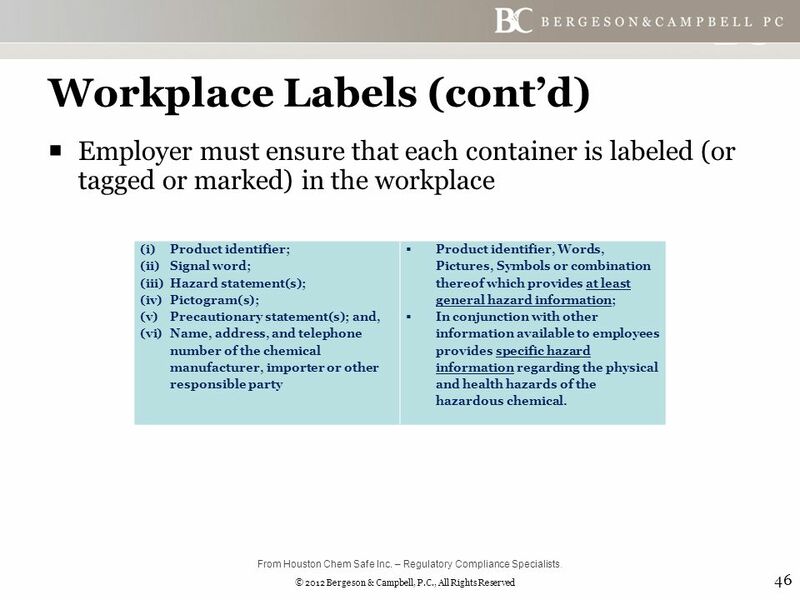 46 © 2012 Bergeson & Campbell, P.C., All Rights Reserved Workplace Labels (cont’d)  Employer must ensure that each container is labeled (or tagged or marked) in the workplace 46 (i)Product identifier; (ii)Signal word; (iii)Hazard statement(s); (iv)Pictogram(s); (v)Precautionary statement(s); and, (vi)Name, address, and telephone number of the chemical manufacturer, importer or other responsible party  Product identifier, Words, Pictures, Symbols or combination thereof which provides at least general hazard information;  In conjunction with other information available to employees provides specific hazard information regarding the physical and health hazards of the hazardous chemical. From Houston Chem Safe Inc. – Regulatory Compliance Specialists. 47 © 2012 Bergeson & Campbell, P.C., All Rights Reserved Workplace Labels (cont’d) 47 From Houston Chem Safe Inc. – Regulatory Compliance Specialists. 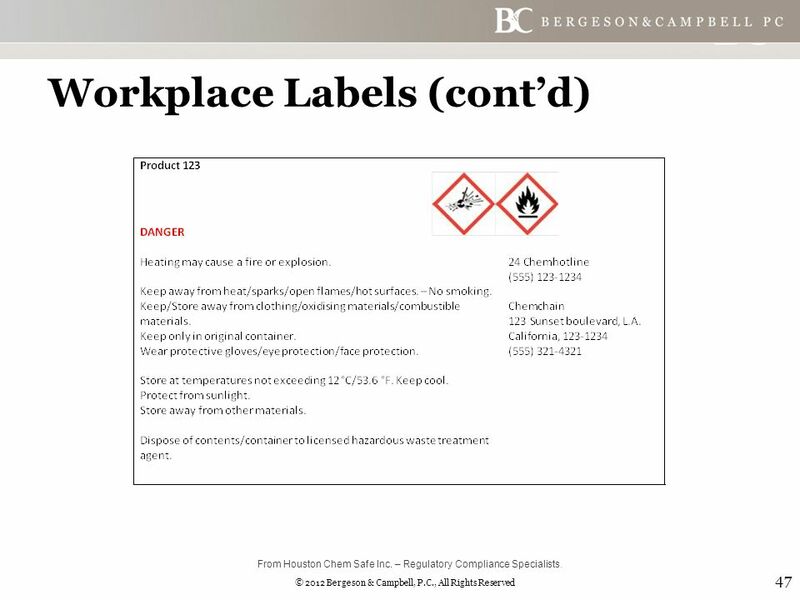 48 © 2012 Bergeson & Campbell, P.C., All Rights Reserved Workplace Labels (cont’d) 48 Product 123 DANGER Heating may cause a fire or explosion. 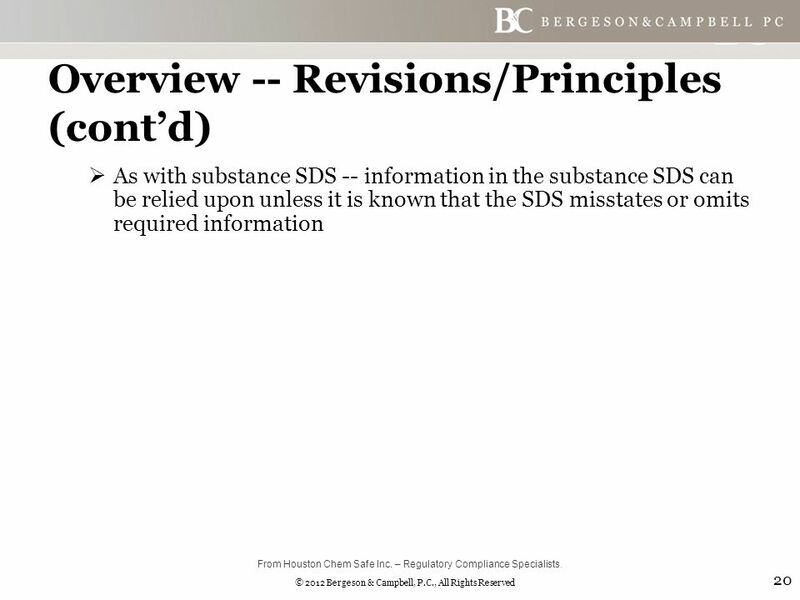 SDS Containing full H-statements, P-statements and supplier contact information. From Houston Chem Safe Inc. – Regulatory Compliance Specialists. 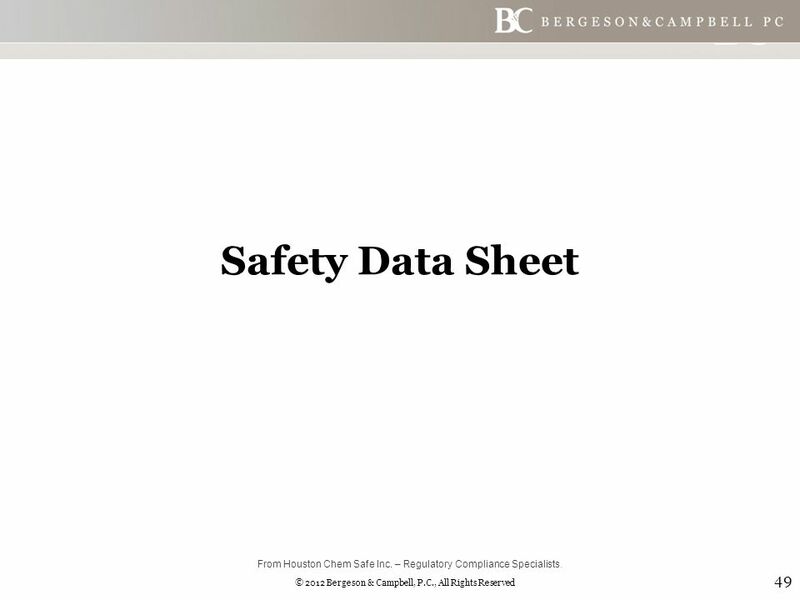 49 © 2012 Bergeson & Campbell, P.C., All Rights Reserved Safety Data Sheet 49 From Houston Chem Safe Inc. – Regulatory Compliance Specialists. 50 © 2012 Bergeson & Campbell, P.C., All Rights Reserved SDS  Overview  Implementation Dates 50 From Houston Chem Safe Inc. – Regulatory Compliance Specialists. 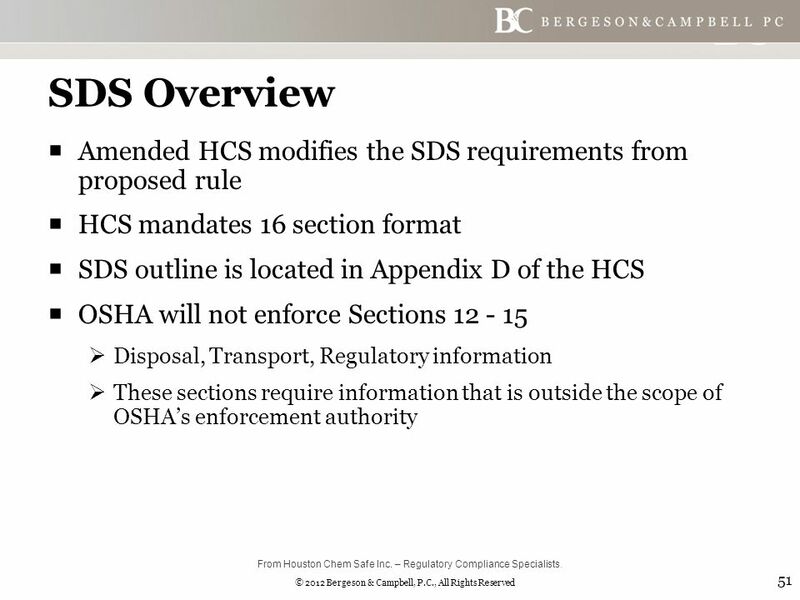 51 © 2012 Bergeson & Campbell, P.C., All Rights Reserved SDS Overview  Amended HCS modifies the SDS requirements from proposed rule  HCS mandates 16 section format  SDS outline is located in Appendix D of the HCS  OSHA will not enforce Sections 12 - 15  Disposal, Transport, Regulatory information  These sections require information that is outside the scope of OSHA’s enforcement authority 51 From Houston Chem Safe Inc. – Regulatory Compliance Specialists. 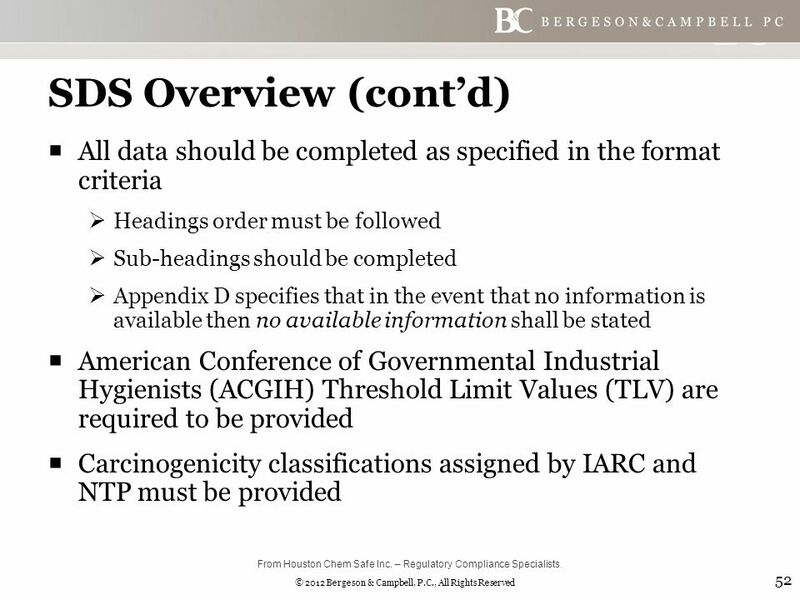 52 © 2012 Bergeson & Campbell, P.C., All Rights Reserved SDS Overview (cont’d)  All data should be completed as specified in the format criteria  Headings order must be followed  Sub-headings should be completed  Appendix D specifies that in the event that no information is available then no available information shall be stated  American Conference of Governmental Industrial Hygienists (ACGIH) Threshold Limit Values (TLV) are required to be provided  Carcinogenicity classifications assigned by IARC and NTP must be provided 52 From Houston Chem Safe Inc. – Regulatory Compliance Specialists. 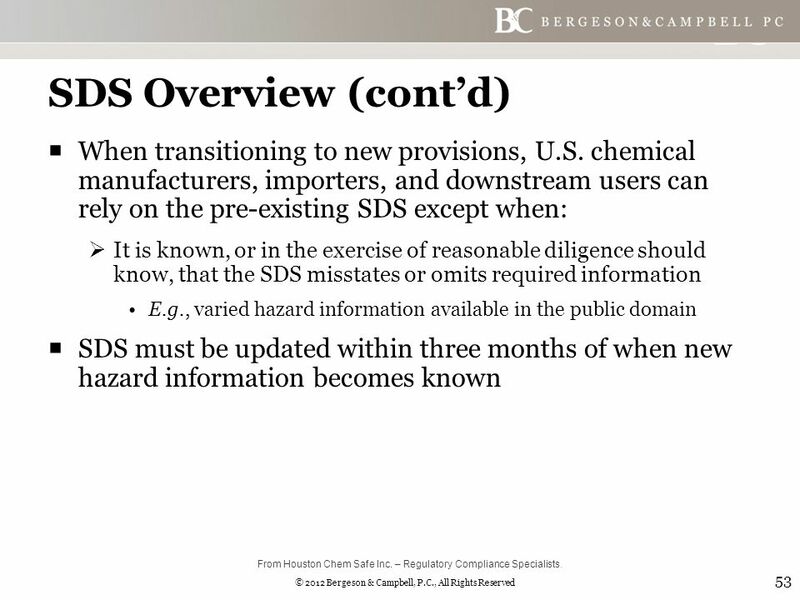 53 © 2012 Bergeson & Campbell, P.C., All Rights Reserved SDS Overview (cont’d)  When transitioning to new provisions, U.S. chemical manufacturers, importers, and downstream users can rely on the pre-existing SDS except when:  It is known, or in the exercise of reasonable diligence should know, that the SDS misstates or omits required information E.g., varied hazard information available in the public domain  SDS must be updated within three months of when new hazard information becomes known 53 From Houston Chem Safe Inc. – Regulatory Compliance Specialists. 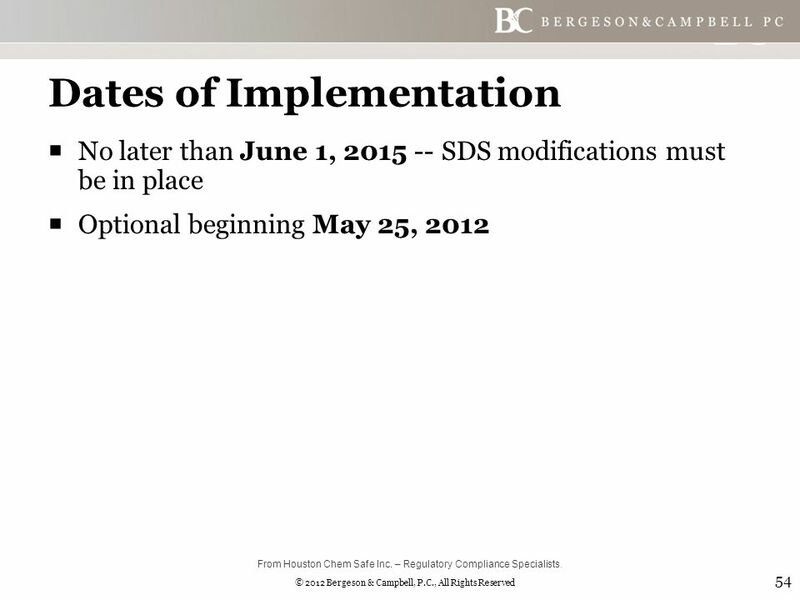 54 © 2012 Bergeson & Campbell, P.C., All Rights Reserved Dates of Implementation  No later than June 1, 2015 -- SDS modifications must be in place  Optional beginning May 25, 2012 54 From Houston Chem Safe Inc. – Regulatory Compliance Specialists. 55 © 2012 Bergeson & Campbell, P.C., All Rights Reserved TRAINING, INFORMATION, AND TRADE SECRETS 55 From Houston Chem Safe Inc. – Regulatory Compliance Specialists. 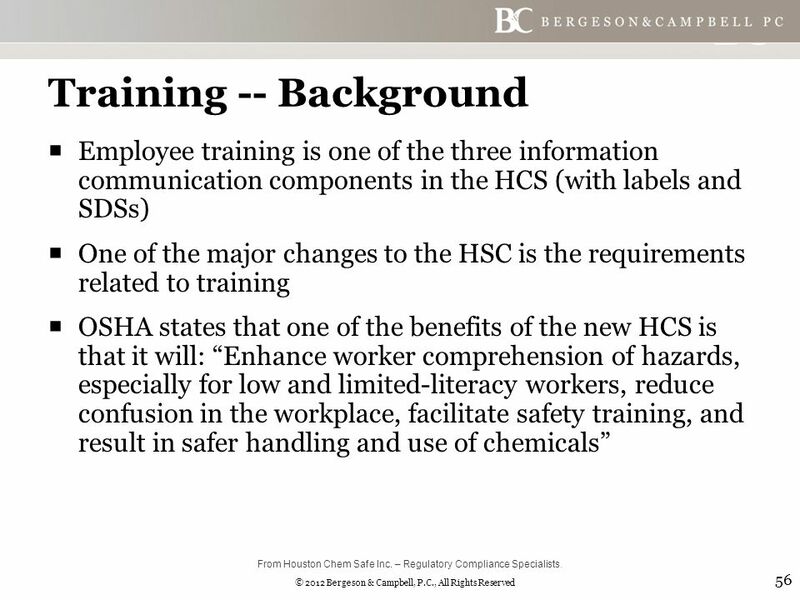 56 © 2012 Bergeson & Campbell, P.C., All Rights Reserved Training -- Background  Employee training is one of the three information communication components in the HCS (with labels and SDSs)  One of the major changes to the HSC is the requirements related to training  OSHA states that one of the benefits of the new HCS is that it will: “Enhance worker comprehension of hazards, especially for low and limited-literacy workers, reduce confusion in the workplace, facilitate safety training, and result in safer handling and use of chemicals” 56 From Houston Chem Safe Inc. – Regulatory Compliance Specialists. 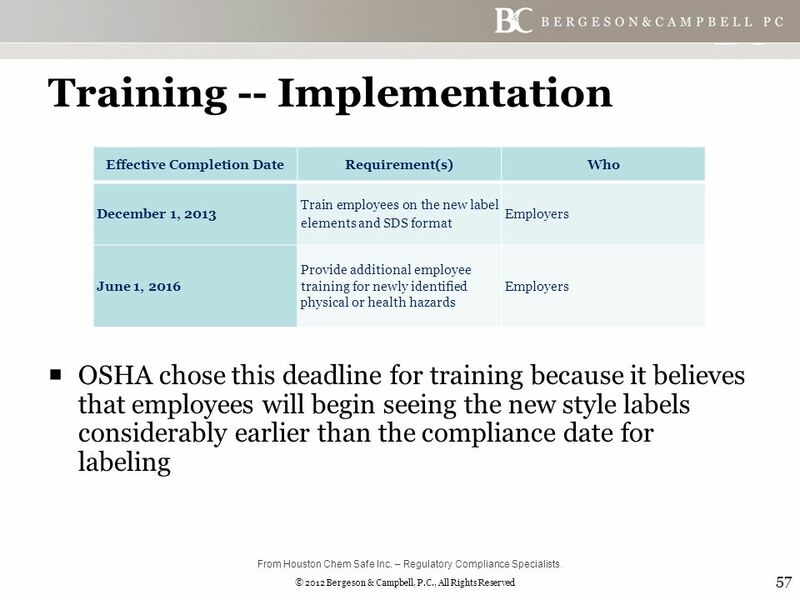 57 © 2012 Bergeson & Campbell, P.C., All Rights Reserved Training -- Implementation  OSHA chose this deadline for training because it believes that employees will begin seeing the new style labels considerably earlier than the compliance date for labeling 57 Effective Completion DateRequirement(s)Who December 1, 2013 Train employees on the new label elements and SDS format Employers June 1, 2016 Provide additional employee training for newly identified physical or health hazards Employers From Houston Chem Safe Inc. – Regulatory Compliance Specialists. 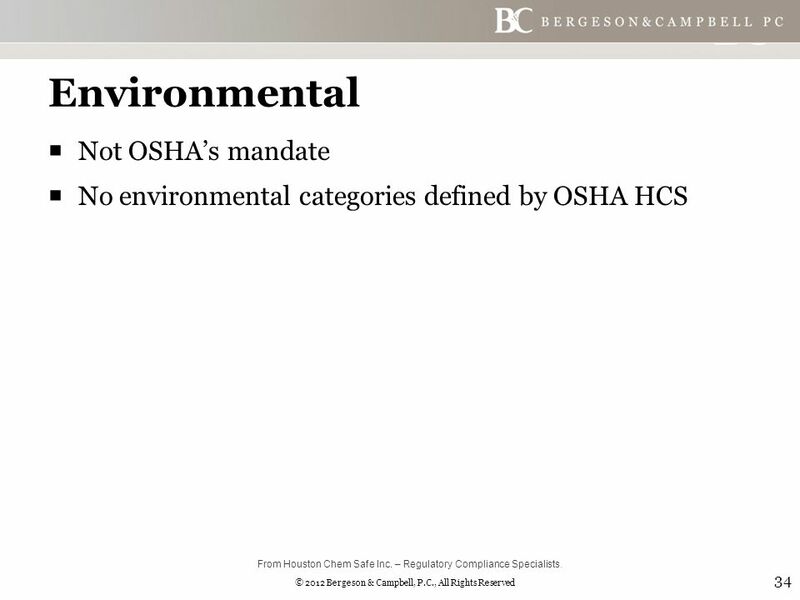 58 © 2012 Bergeson & Campbell, P.C., All Rights Reserved Training -- What Remains the Same  Training is already a component of the HCS  Definitions of “employer” and “employee” are unchanged from former HCS to current HCS  Because GHS does not have any training requirements, OSHA’s modification to HCS is only what is necessary to ensure appropriate compliance with the revised standard, and does not introduce any new approaches or requirements 58 From Houston Chem Safe Inc. – Regulatory Compliance Specialists. 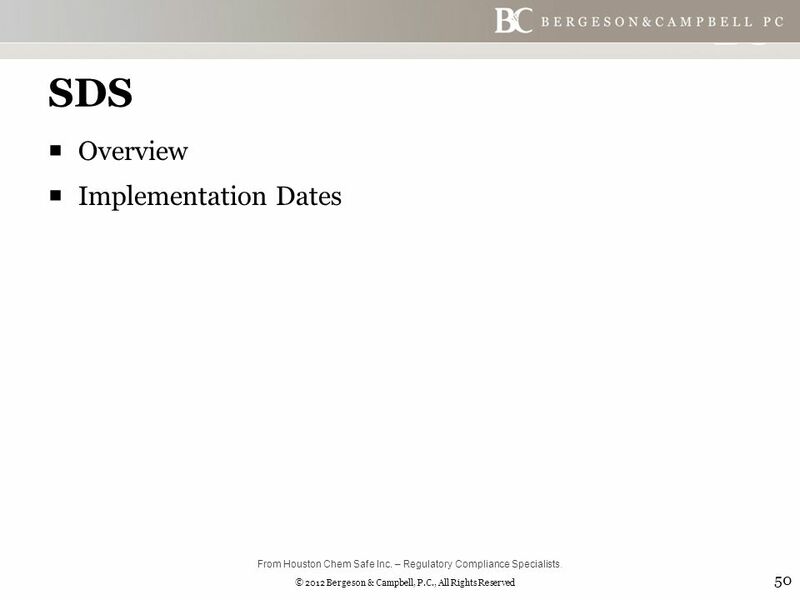 59 © 2012 Bergeson & Campbell, P.C., All Rights Reserved Training -- What Changed  The revised training provisions at 29 C.F.R. § 1900.1200(h):  Conforms new hazard definitions into training requirements  Requires that training ensures employees are familiar with the new label, SDS formats, and presentation of information  Clarifies that the labels on shipped containers and workplace labels must be explained 59 From Houston Chem Safe Inc. – Regulatory Compliance Specialists. 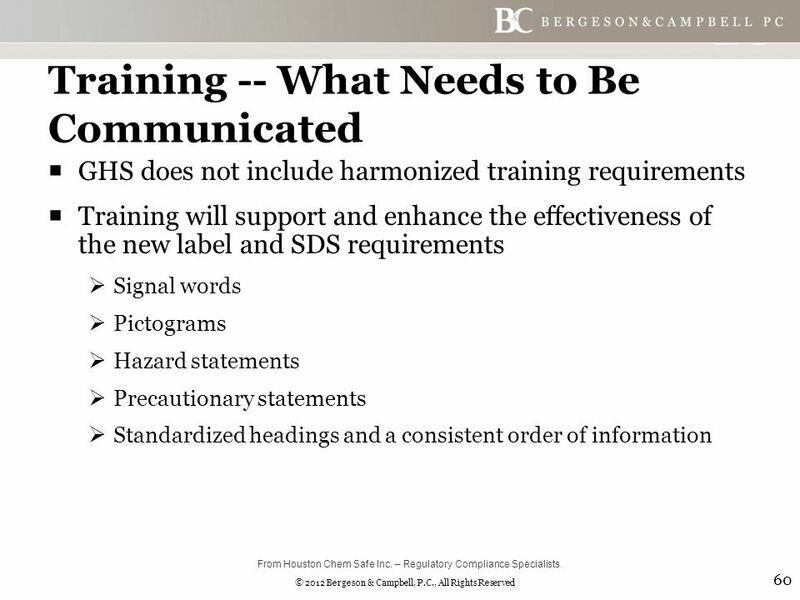 60 © 2012 Bergeson & Campbell, P.C., All Rights Reserved Training -- What Needs to Be Communicated  GHS does not include harmonized training requirements  Training will support and enhance the effectiveness of the new label and SDS requirements  Signal words  Pictograms  Hazard statements  Precautionary statements  Standardized headings and a consistent order of information 60 From Houston Chem Safe Inc. – Regulatory Compliance Specialists. 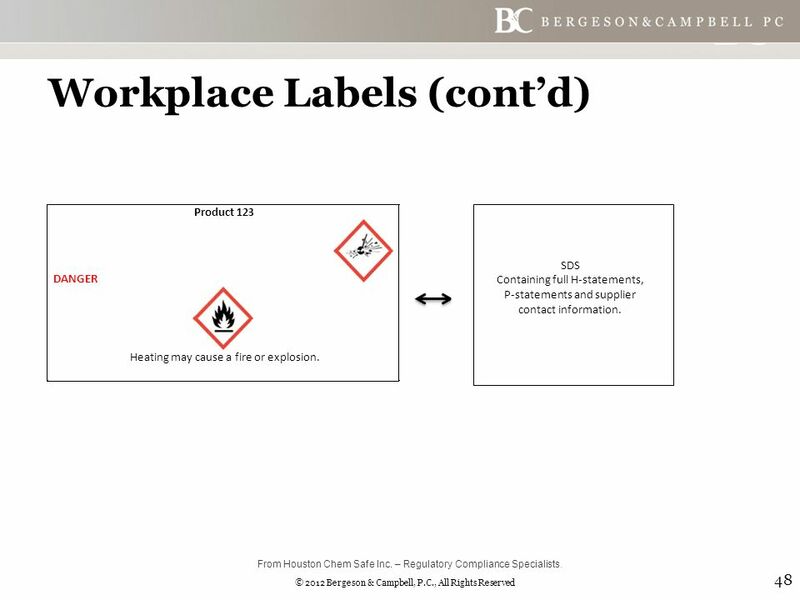 61 © 2012 Bergeson & Campbell, P.C., All Rights Reserved Training -- What Needs to Be Communicated (cont’d)  Note that there is a transition period: Employers may wish to explain to employees why labels and SDS may not be the same for the next few years 61 From Houston Chem Safe Inc. – Regulatory Compliance Specialists. 62 © 2012 Bergeson & Campbell, P.C., All Rights Reserved Training -- Resources  United Nations Institute for Training and Research UNITAR training materials: http://www2.unitar.org/cwm/publications/ghs.aspx http://www2.unitar.org/cwm/publications/ghs.aspx  OSHA guidance and compliance assistance materials: http://www.osha.gov/dsg/hazcom/index.html http://www.osha.gov/dsg/hazcom/index.html  GHS Annex 6 (Comprehensibility testing methodology): http://www.unece.org/fileadmin/DAM/trans/danger/p ubli/ghs/ghs_rev04/English/10e_annex6.pdf http://www.unece.org/fileadmin/DAM/trans/danger/p ubli/ghs/ghs_rev04/English/10e_annex6.pdf 62 From Houston Chem Safe Inc. – Regulatory Compliance Specialists. 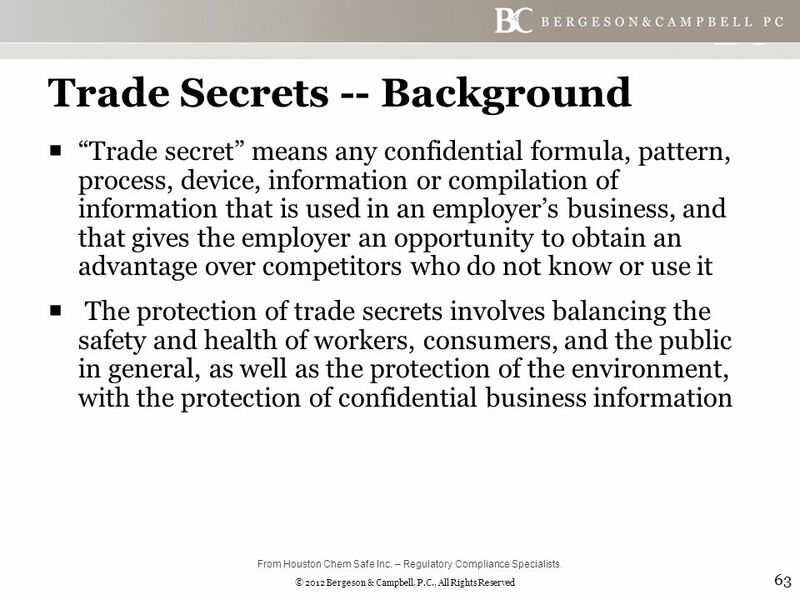 63 © 2012 Bergeson & Campbell, P.C., All Rights Reserved Trade Secrets -- Background  “Trade secret” means any confidential formula, pattern, process, device, information or compilation of information that is used in an employer’s business, and that gives the employer an opportunity to obtain an advantage over competitors who do not know or use it  The protection of trade secrets involves balancing the safety and health of workers, consumers, and the public in general, as well as the protection of the environment, with the protection of confidential business information 63 From Houston Chem Safe Inc. – Regulatory Compliance Specialists. 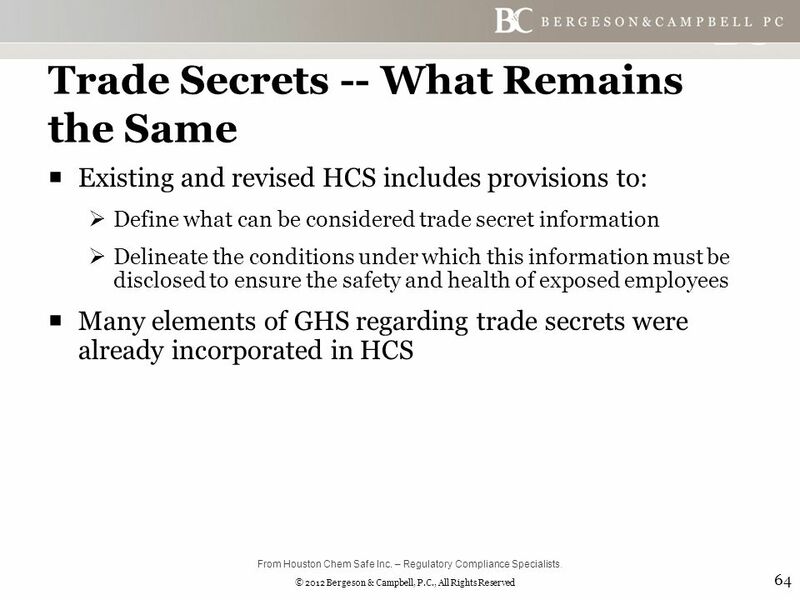 64 © 2012 Bergeson & Campbell, P.C., All Rights Reserved Trade Secrets -- What Remains the Same  Existing and revised HCS includes provisions to:  Define what can be considered trade secret information  Delineate the conditions under which this information must be disclosed to ensure the safety and health of exposed employees  Many elements of GHS regarding trade secrets were already incorporated in HCS 64 From Houston Chem Safe Inc. – Regulatory Compliance Specialists. 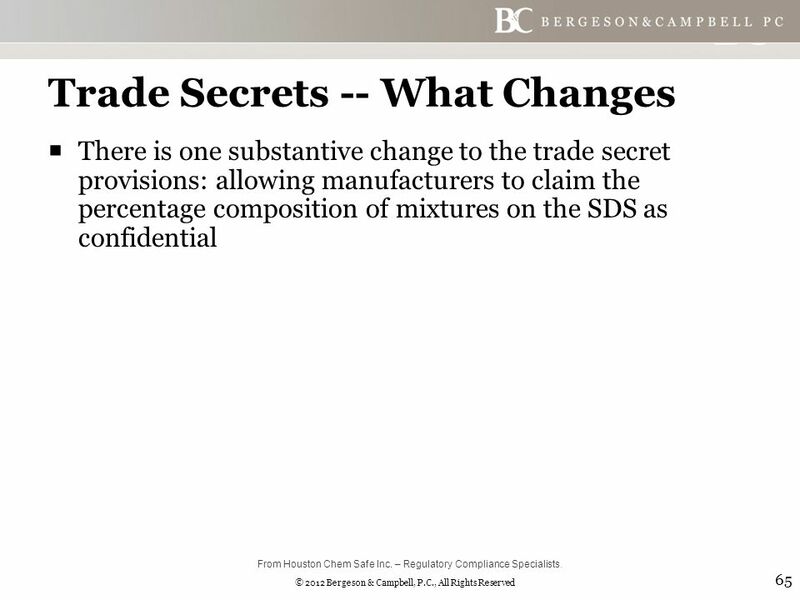 65 © 2012 Bergeson & Campbell, P.C., All Rights Reserved Trade Secrets -- What Changes  There is one substantive change to the trade secret provisions: allowing manufacturers to claim the percentage composition of mixtures on the SDS as confidential 65 From Houston Chem Safe Inc. – Regulatory Compliance Specialists. 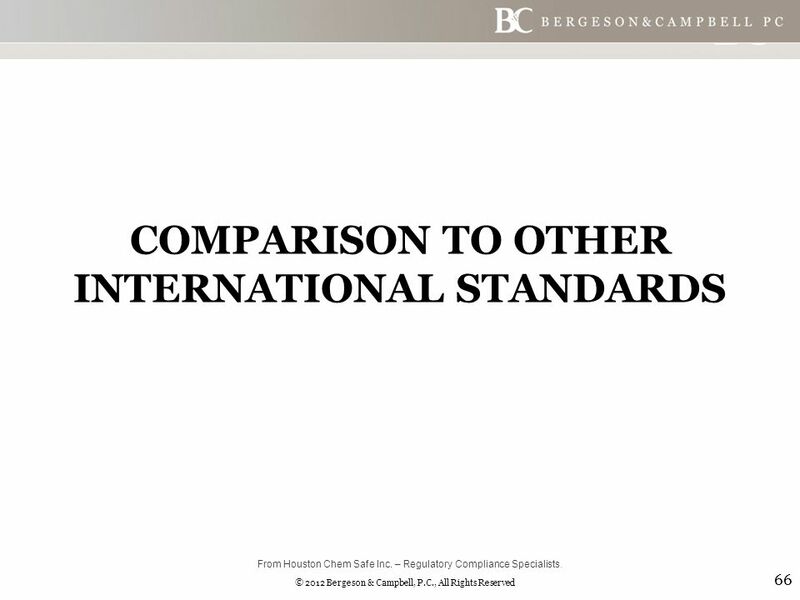 66 © 2012 Bergeson & Campbell, P.C., All Rights Reserved COMPARISON TO OTHER INTERNATIONAL STANDARDS 66 From Houston Chem Safe Inc. – Regulatory Compliance Specialists. 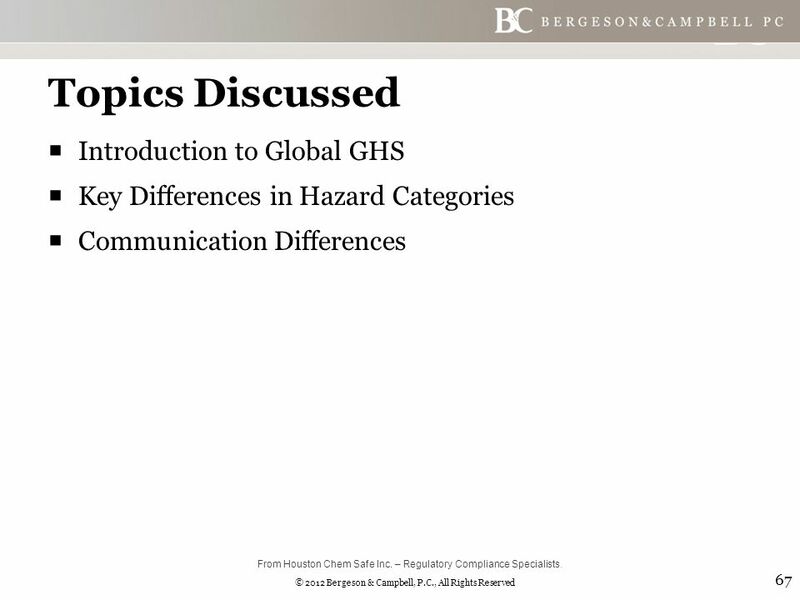 67 © 2012 Bergeson & Campbell, P.C., All Rights Reserved Topics Discussed  Introduction to Global GHS  Key Differences in Hazard Categories  Communication Differences 67 From Houston Chem Safe Inc. – Regulatory Compliance Specialists. 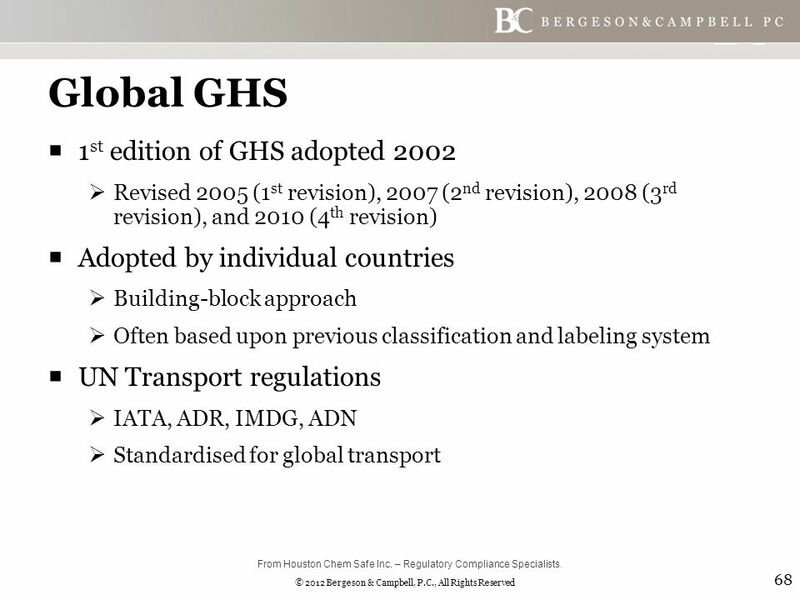 68 © 2012 Bergeson & Campbell, P.C., All Rights Reserved Global GHS  1 st edition of GHS adopted 2002  Revised 2005 (1 st revision), 2007 (2 nd revision), 2008 (3 rd revision), and 2010 (4 th revision)  Adopted by individual countries  Building-block approach  Often based upon previous classification and labeling system  UN Transport regulations  IATA, ADR, IMDG, ADN  Standardised for global transport 68 From Houston Chem Safe Inc. – Regulatory Compliance Specialists. 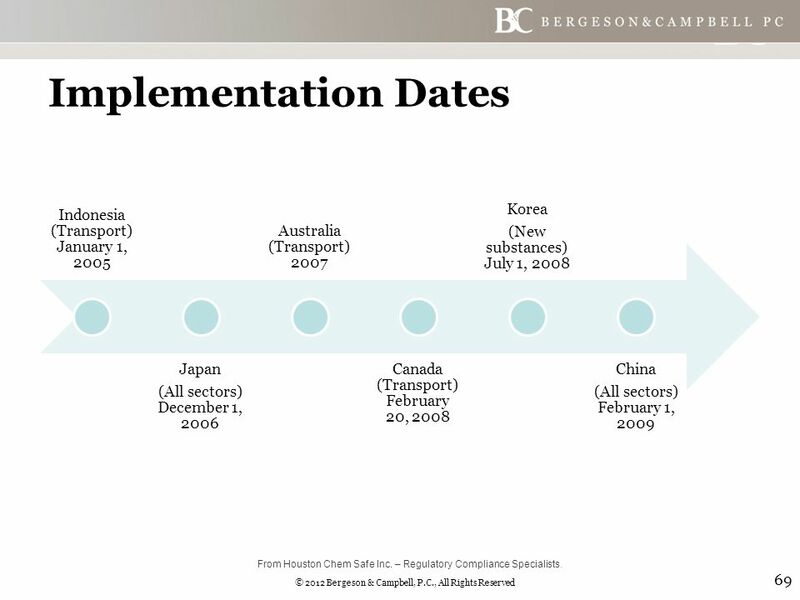 69 © 2012 Bergeson & Campbell, P.C., All Rights Reserved Implementation Dates 69 Indonesia (Transport) January 1, 2005 Japan (All sectors) December 1, 2006 Australia (Transport) 2007 Canada (Transport) February 20, 2008 Korea (New substances) July 1, 2008 China (All sectors) February 1, 2009 From Houston Chem Safe Inc. – Regulatory Compliance Specialists. 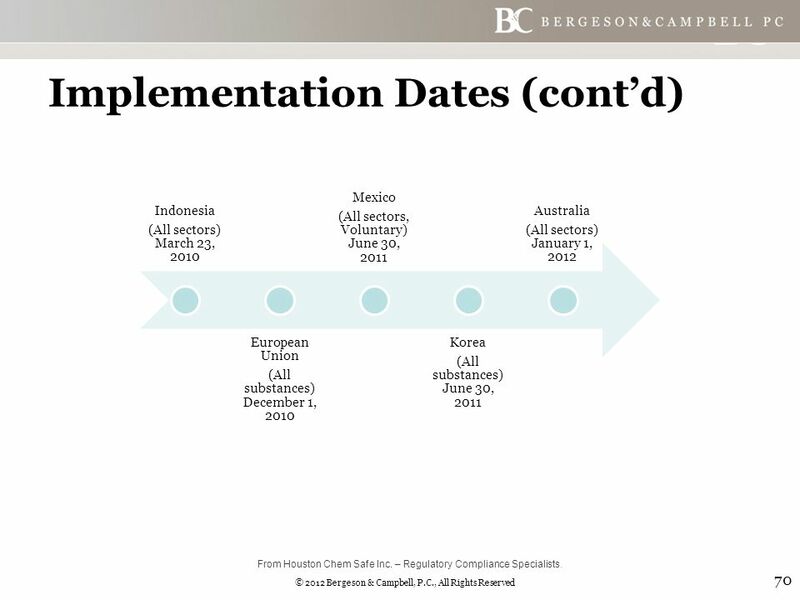 70 © 2012 Bergeson & Campbell, P.C., All Rights Reserved Implementation Dates (cont’d) 70 Indonesia (All sectors) March 23, 2010 European Union (All substances) December 1, 2010 Mexico (All sectors, Voluntary) June 30, 2011 Korea (All substances) June 30, 2011 Australia (All sectors) January 1, 2012 From Houston Chem Safe Inc. – Regulatory Compliance Specialists. 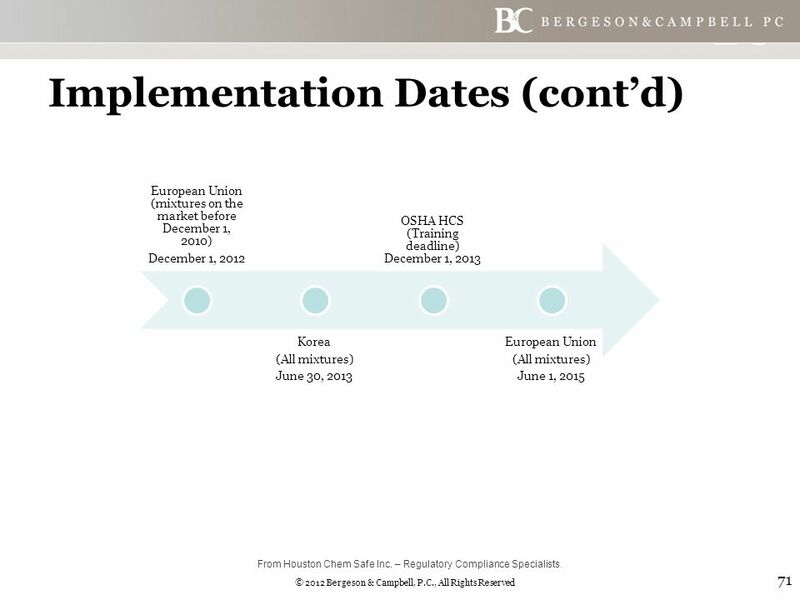 71 © 2012 Bergeson & Campbell, P.C., All Rights Reserved Implementation Dates (cont’d) 71 European Union (mixtures on the market before December 1, 2010) December 1, 2012 Korea (All mixtures) June 30, 2013 OSHA HCS (Training deadline) December 1, 2013 European Union (All mixtures) June 1, 2015 From Houston Chem Safe Inc. – Regulatory Compliance Specialists. 72 © 2012 Bergeson & Campbell, P.C., All Rights Reserved Differences in Communication  Basic Differences  Language  Emergency contact information  Company contact details  Label size and position 72 From Houston Chem Safe Inc. – Regulatory Compliance Specialists. 73 © 2012 Bergeson & Campbell, P.C., All Rights Reserved Key Differences in Hazard Classification  Pre-existing classification thresholds  Building-block approach  Specific concerns -- allowances made for specific industry sectors 73 From Houston Chem Safe Inc. – Regulatory Compliance Specialists. 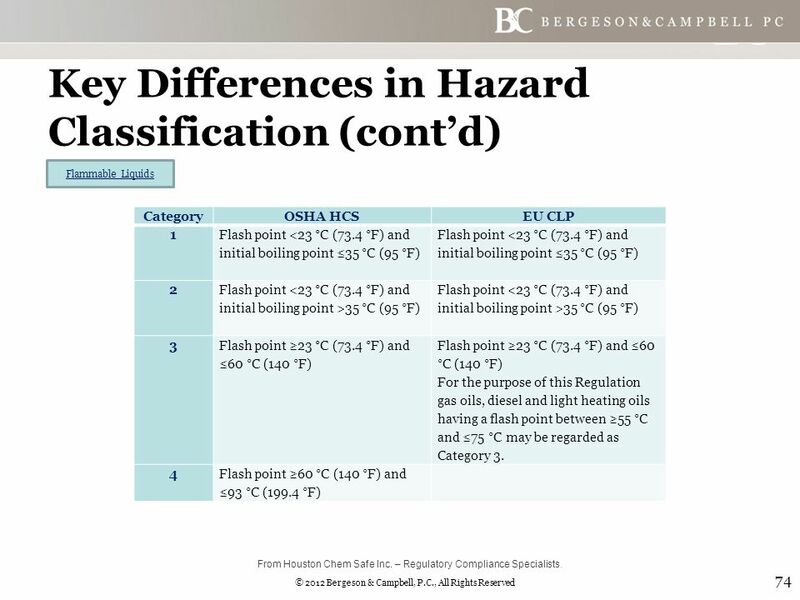 74 © 2012 Bergeson & Campbell, P.C., All Rights Reserved Key Differences in Hazard Classification (cont’d) CategoryOSHA HCSEU CLP 1 Flash point <23 °C (73.4 °F) and initial boiling point ≤35 °C (95 °F) 2 Flash point 35 °C (95 °F) 3 Flash point ≥23 °C (73.4 °F) and ≤60 °C (140 °F) For the purpose of this Regulation gas oils, diesel and light heating oils having a flash point between ≥55 °C and ≤75 °C may be regarded as Category 3. 4Flash point ≥60 °C (140 °F) and ≤93 °C (199.4 °F) 74 Flammable Liquids From Houston Chem Safe Inc. – Regulatory Compliance Specialists. 75 © 2012 Bergeson & Campbell, P.C., All Rights Reserved Key Differences in Hazard Classification (cont’d) 75 CategoryOSHA HCS 1 CategoryEU CLP 1A Substances showing a high frequency of occurrence in humans and/or a high potency in animals can be presumed to have the potential to produce significant sensitization in humans. Severity of reaction may also be considered. 1 (i) if there is evidence in humans that the substance can lead to sensitization by skin contact in a substantial number of persons, or (ii) if there are positive results from an appropriate animal test. 1BSubstances showing a low to moderate frequency of occurrence in humans and/or a low to moderate potency in animals can be presumed to have the potential to produce sensitization in humans. Severity of reaction may also be considered. 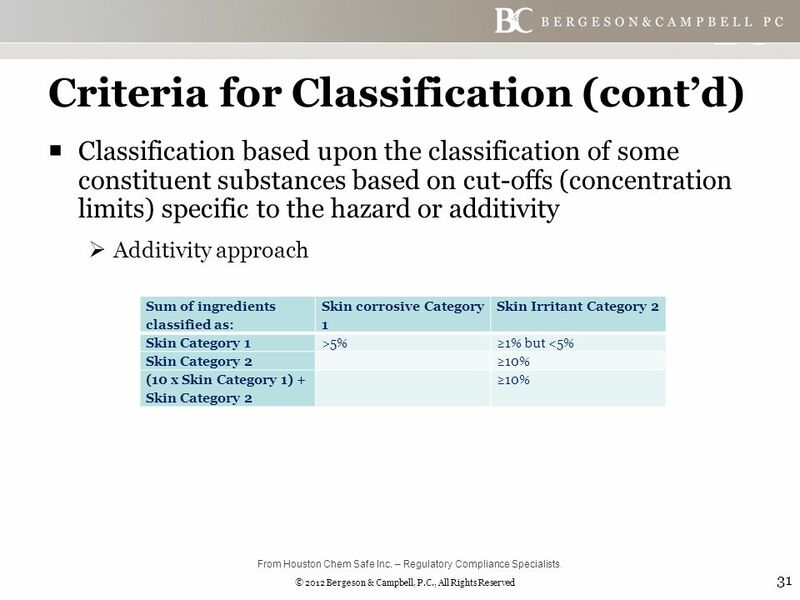 1 Where data are not sufficient for sub-categorization, skin sensitizers shall be classified in Category 1. 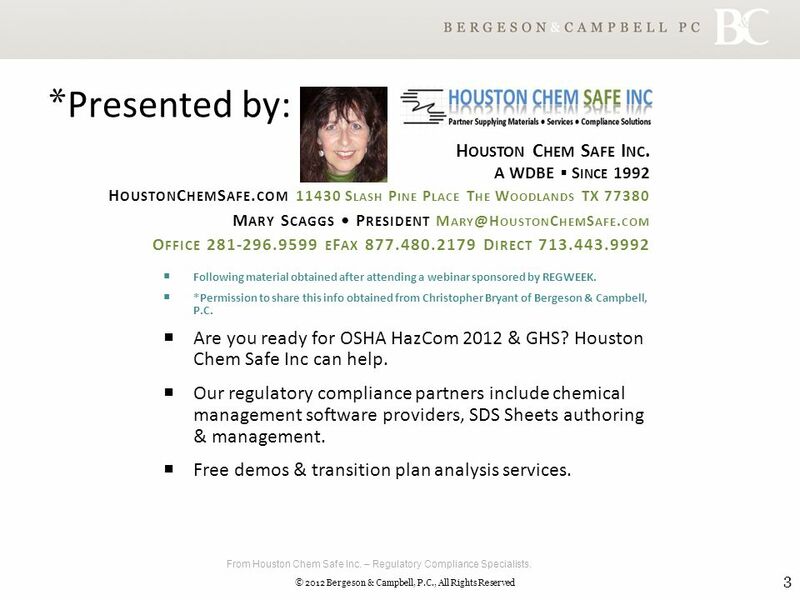 Sensitisation From Houston Chem Safe Inc. – Regulatory Compliance Specialists. 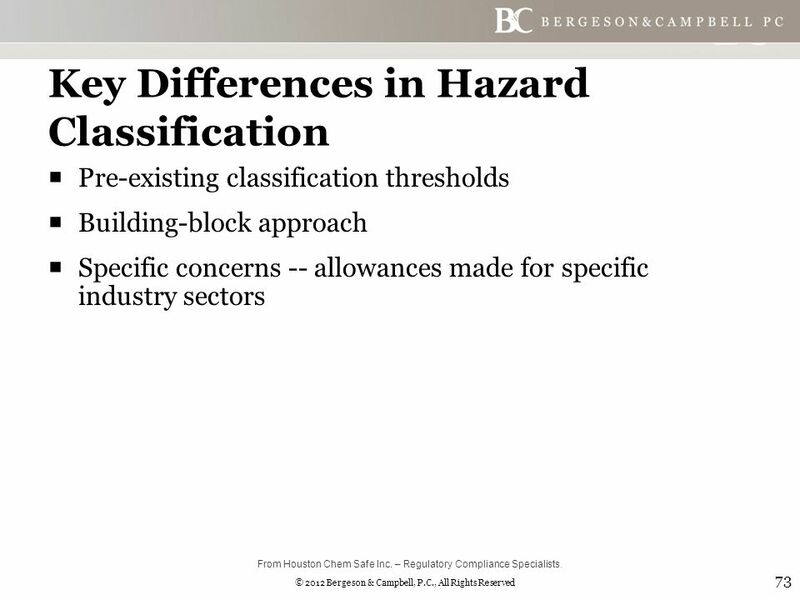 76 © 2012 Bergeson & Campbell, P.C., All Rights Reserved Key Differences in Hazard Classification (cont’d) 76 -= No generic threshold. 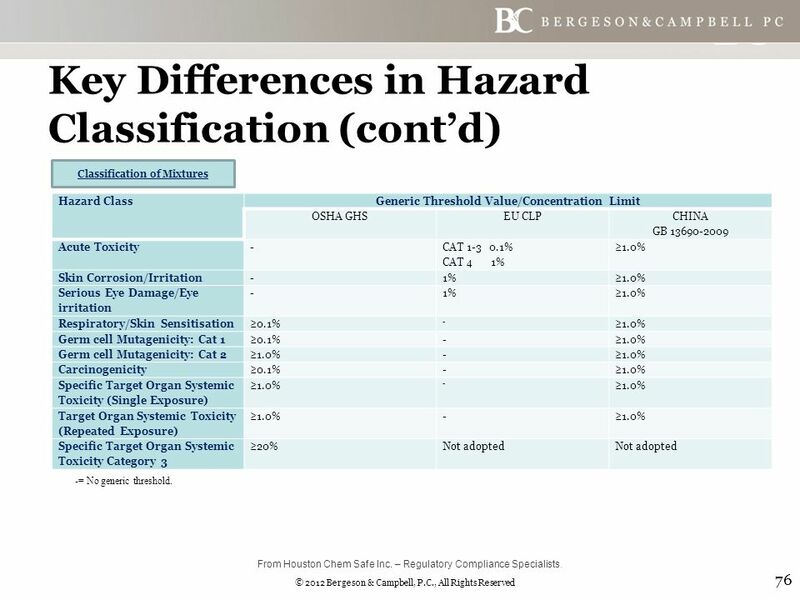 Hazard ClassGeneric Threshold Value/Concentration Limit OSHA GHSEU CLP CHINA GB 13690-2009 Acute Toxicity- CAT 1-3 0.1% CAT 4 1% ≥1.0% Skin Corrosion/Irritation-1%≥1.0% Serious Eye Damage/Eye irritation -1%≥1.0% Respiratory/Skin Sensitisation≥0.1% - ≥1.0% Germ cell Mutagenicity: Cat 1≥0.1%-≥1.0% Germ cell Mutagenicity: Cat 2≥1.0%- Carcinogenicity≥0.1%-≥1.0% Specific Target Organ Systemic Toxicity (Single Exposure) ≥1.0% - Target Organ Systemic Toxicity (Repeated Exposure) ≥1.0%- Specific Target Organ Systemic Toxicity Category 3 ≥20%Not adopted Classification of Mixtures From Houston Chem Safe Inc. – Regulatory Compliance Specialists. 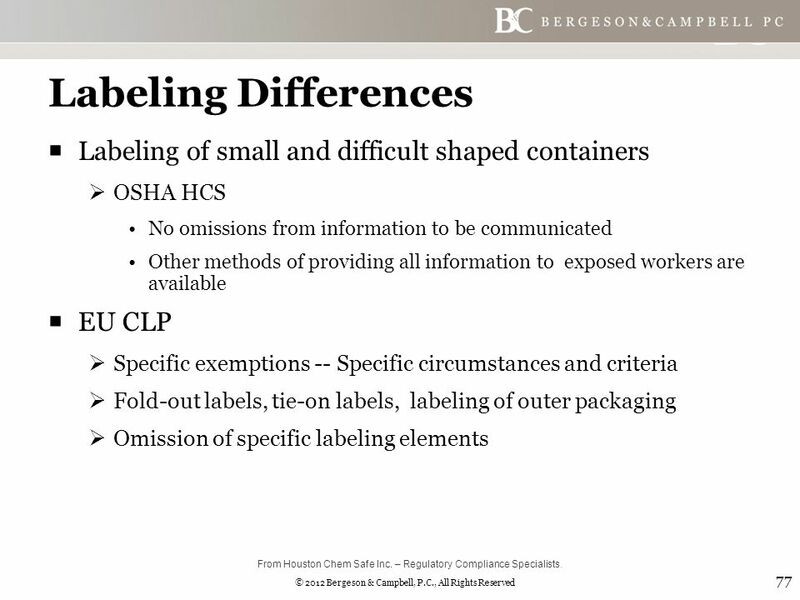 77 © 2012 Bergeson & Campbell, P.C., All Rights Reserved Labeling Differences  Labeling of small and difficult shaped containers  OSHA HCS No omissions from information to be communicated Other methods of providing all information to exposed workers are available  EU CLP  Specific exemptions -- Specific circumstances and criteria  Fold-out labels, tie-on labels, labeling of outer packaging  Omission of specific labeling elements 77 From Houston Chem Safe Inc. – Regulatory Compliance Specialists. 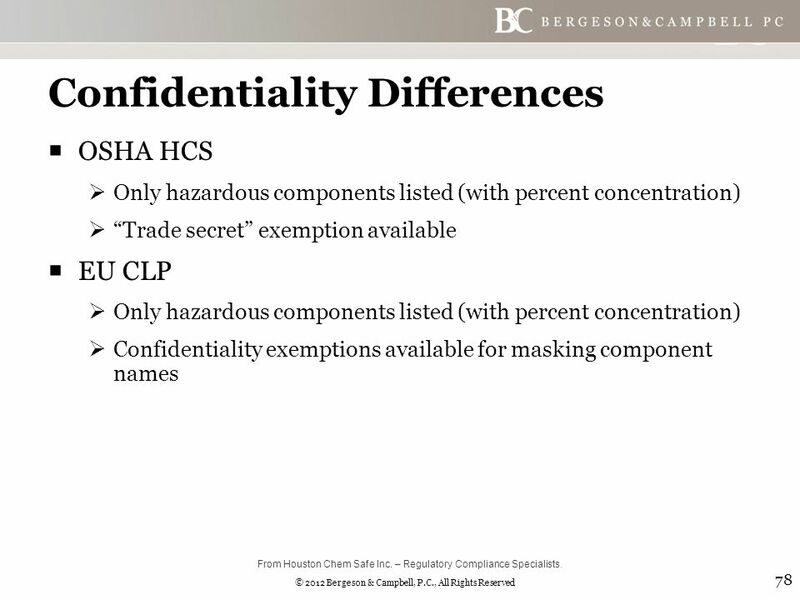 78 © 2012 Bergeson & Campbell, P.C., All Rights Reserved Confidentiality Differences  OSHA HCS  Only hazardous components listed (with percent concentration)  “Trade secret” exemption available  EU CLP  Only hazardous components listed (with percent concentration)  Confidentiality exemptions available for masking component names 78 From Houston Chem Safe Inc. – Regulatory Compliance Specialists. 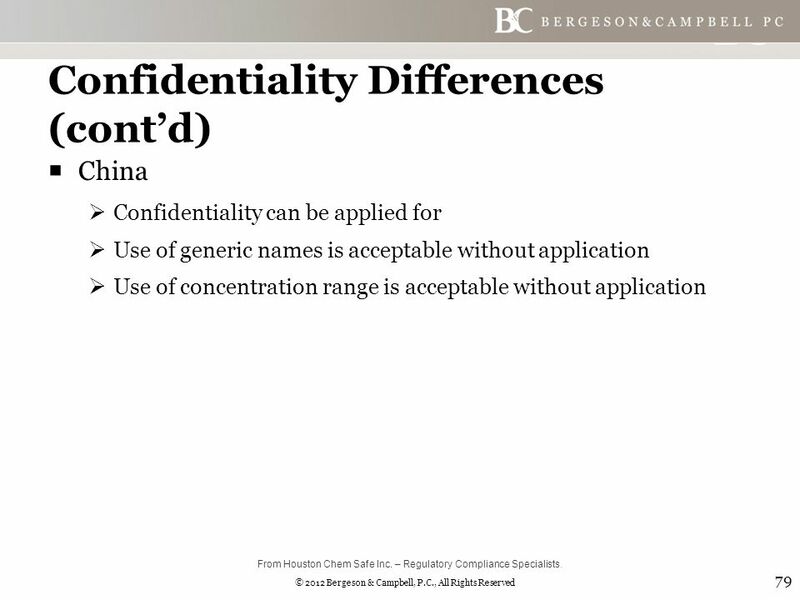 79 © 2012 Bergeson & Campbell, P.C., All Rights Reserved Confidentiality Differences (cont’d)  China  Confidentiality can be applied for  Use of generic names is acceptable without application  Use of concentration range is acceptable without application 79 From Houston Chem Safe Inc. – Regulatory Compliance Specialists. 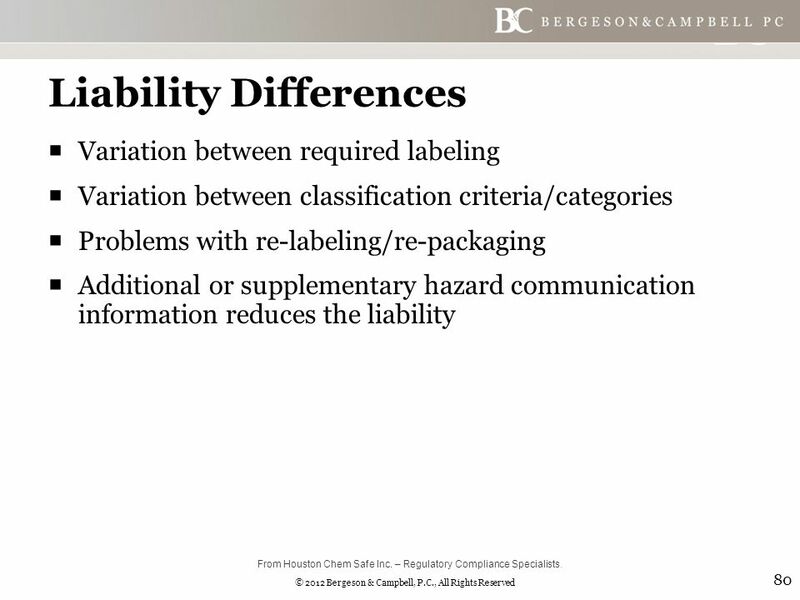 80 © 2012 Bergeson & Campbell, P.C., All Rights Reserved Liability Differences  Variation between required labeling  Variation between classification criteria/categories  Problems with re-labeling/re-packaging  Additional or supplementary hazard communication information reduces the liability 80 From Houston Chem Safe Inc. – Regulatory Compliance Specialists. 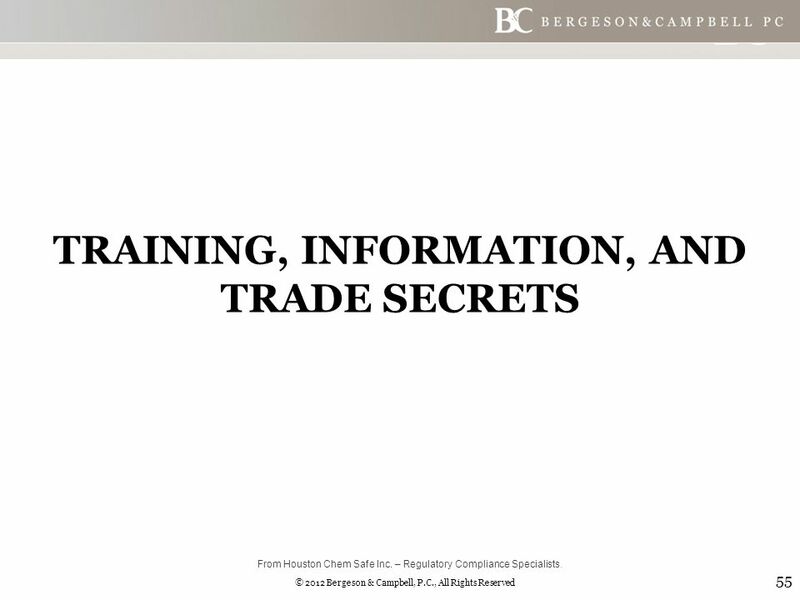 Download ppt "© 2012 Bergeson & Campbell, P.C., All Rights Reserved * Presented by: 1 H OUSTON C HEM S AFE I NC. A WDBE ▪ S INCE 1992 H OUSTON C HEM S AFE. COM 11430." 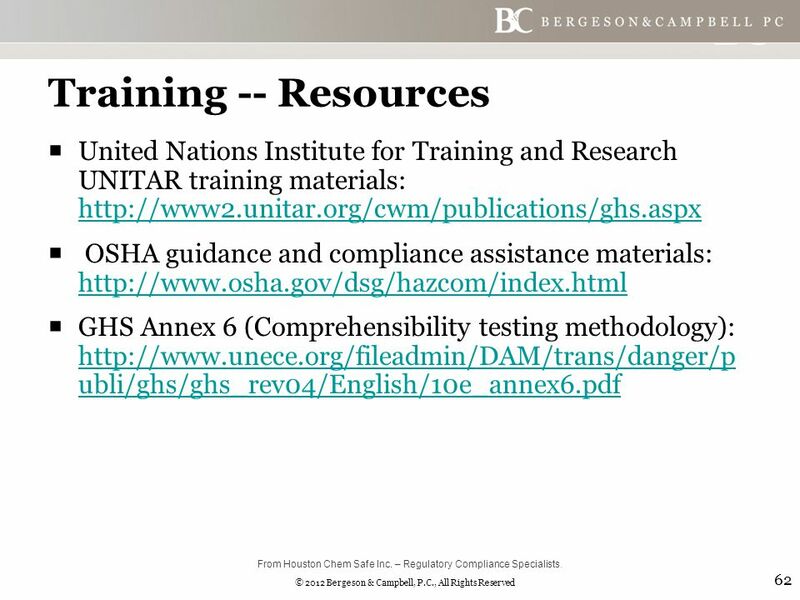 2013 Training Requirements for the Revised OSHA Hazard Communication Standard This presentation (“Employers Hazcom Training Requirements”) summarizes the. Bill Balek ISSA July 31, 2013 GHS HazCom Training. HAZARD COMMUNICATION REQUIREMENTS Site Specific Written Program Chemical Inventory MSDSs/SDSs Labeling Non-routine Tasks Contractors Training. WELCOME Presented by our Referral Partner: Demystifying GHS Globally Harmonized System of Classification and Labeling of Chemicals. WCAM GHS Training December Introduction  The federal Hazard Communication Standard says that you have a “Right-To-Know” what hazards you face on. The Hazard Communication Standard (HCS) is based on a simple concept Employees have both a need and a right to know the hazards and identities of the. Background – Scope and Development of the GHS as an International System Hazard Classification – Physical Hazards – Health Hazards – Environmental Hazards.  Chemical manufacturers & importers must classify each chemical produced or imported. They must: Determine the appropriate hazard classes & associated. DATE  Understand Hazard Communication including revisions to GHS  Label Requirements  Safety Data Sheets. OSHA Hazard Communication Standard Updated- What You Need to Know to be in Compliance Presented By: Heather Stiner, SSPC. Hazard Communication and the Global Harmonized System Joann Natarajan OSHA Austin Area Office. Hazard Communication Standard Globally Harmonized System (GHS) of Classification and Labeling of Chemicals Kathleen Park Medical Technology Program Austin. MIOSHA Update Hazard Communication Training Including GHS Revisions. The GHS: Overview Presentation Peter Haynes Regional Workshop on Chemical Hazard Communication and GHS Implementation for Countries of ASEAN 17 October. WCAM GHS Training December 2013. Introduction  The federal Hazard Communication Standard says that you have a “Right-To-Know” what hazards you face on.